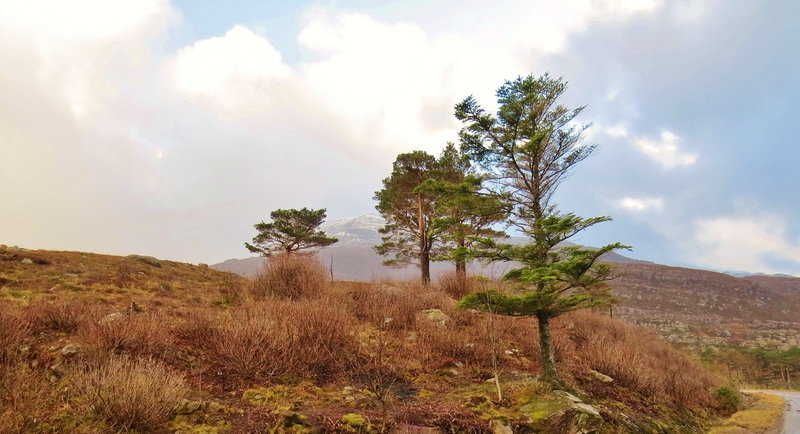 The name, ‘Staffa’, comes from an old Norse word meaning, ‘stave’ or ‘pillar’ island, named so by the Vikings since it reminded them of their houses which were built of ‘vertically placed tree logs’. 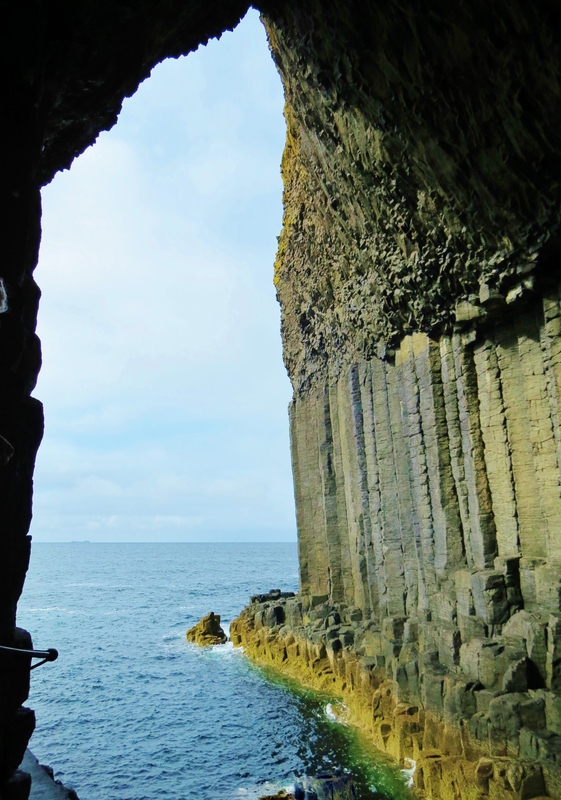 (Wikipedia) In 1772, Staffa was home to a single family living on oats, barley, flax and meat from their few livestock. The island was abandoned as a dwelling place in the late 19th century. 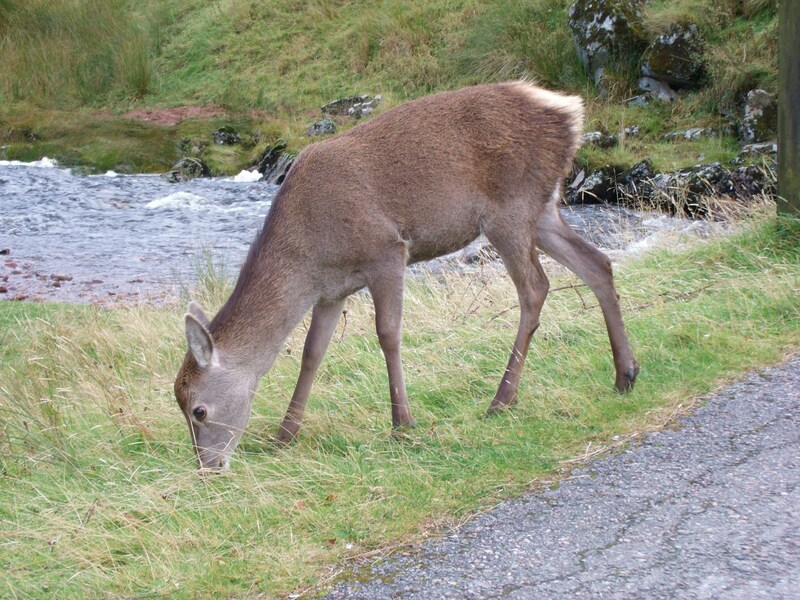 Deer, goats, cattle and, most recently, sheep, have alternately grazed there, but the island’s stewards, The National Trust For Scotland, removed the last of them in 1997 to allow the unique plant life to regenerate and the natural occupants, mostly birds, to come and go and thrive in peace and plenty. 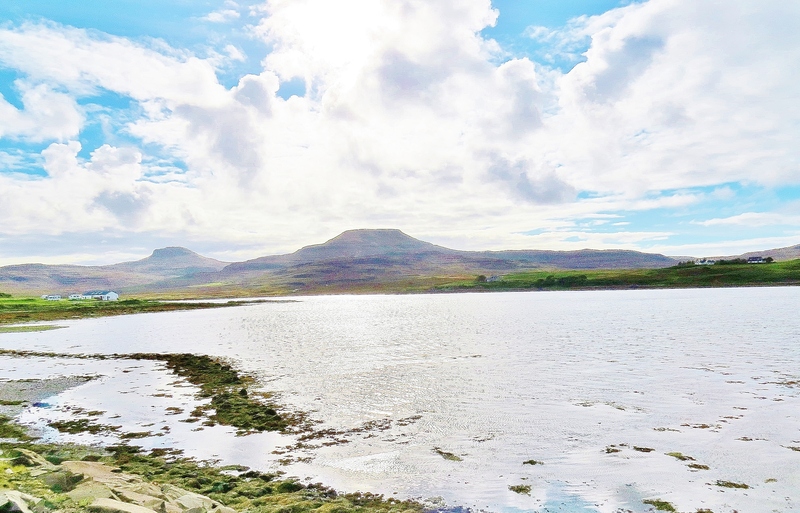 Situated 6 miles (10 kilometres) West of the Isle of Mull, Staffa has an area of 82 acres (32 hectares), with the highest point 138 feet (42 metres) above sea level. 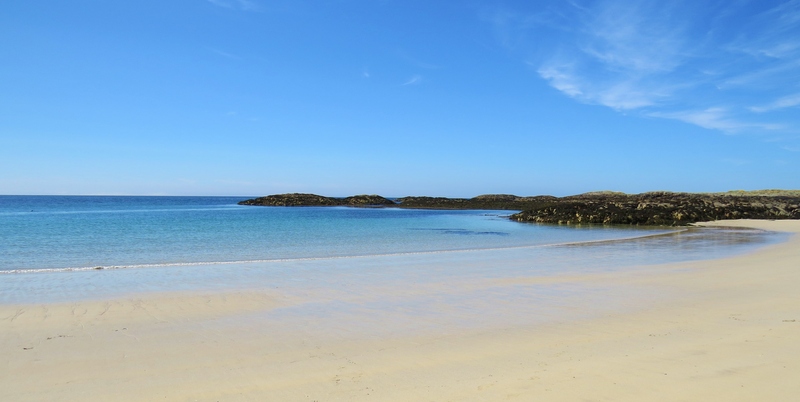 This tiny island hosts a wealth of treasures to delight the hearts of scientists; amateur geologists; wildlife enthusiasts; historians; photographers; lovers of the music of Mendelssohn; as well as anyone who appreciates the awesome beauty and miraculous diversity of the Inner Hebridean Islands. During May and June, atop the island, puffins come in great numbers to breed and nest. 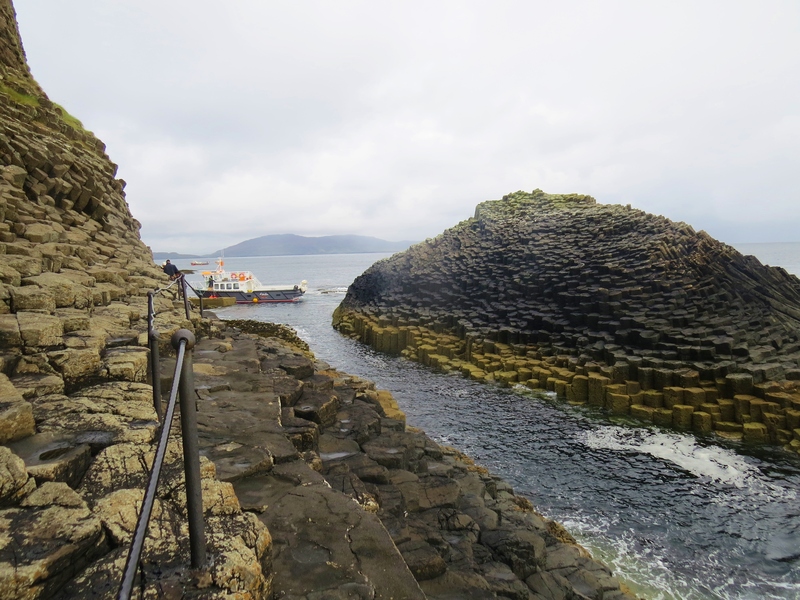 Staffa also becomes home to a variety of other migratory birds and large sea mammals. So, too, come the season’s tourists to experience this thriving wildlife sanctuary, ancient geological wonder and one of the gems in the Sea Kingdom’s crown. 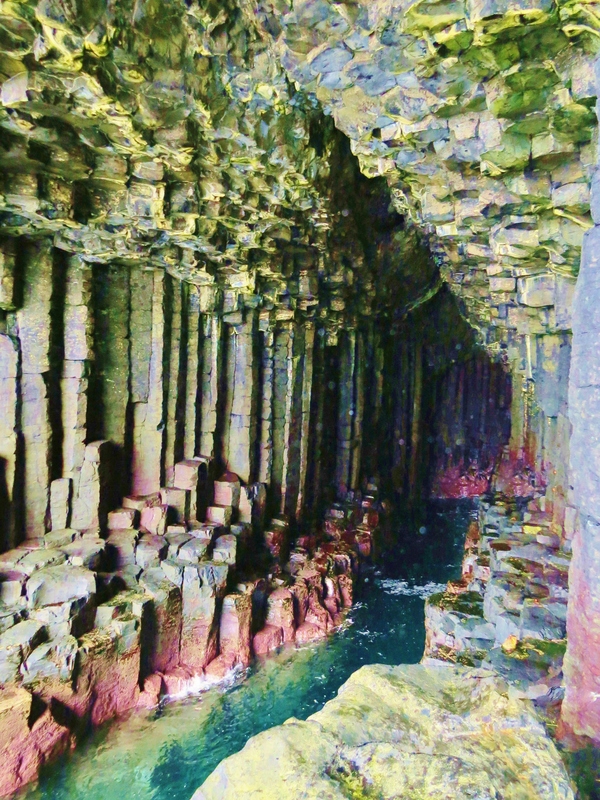 Outside the scientific community, perhaps the biggest attraction on Staffa is the world reknowned ‘Fingal’s Cave’, largely made famous by being the inspiration for Mendelssohn’s Hebrides Overture, popularly known by the name of this cave that inspired him The spectacular cavern, known to the ancients as, ‘The Cave of Melodies’, was seen by the composer who visited there when paddle steamer tours began. So haunted was he by the wild beauty of the area and the sounds he heard inside the cave, he was compelled to write an overture in an attempt to capture both the cavern’s beauty, grandeur and acoustics as well as the wonders beyond, in this mysterious, unique, varied and unbelievably beautiful sea kingdom. 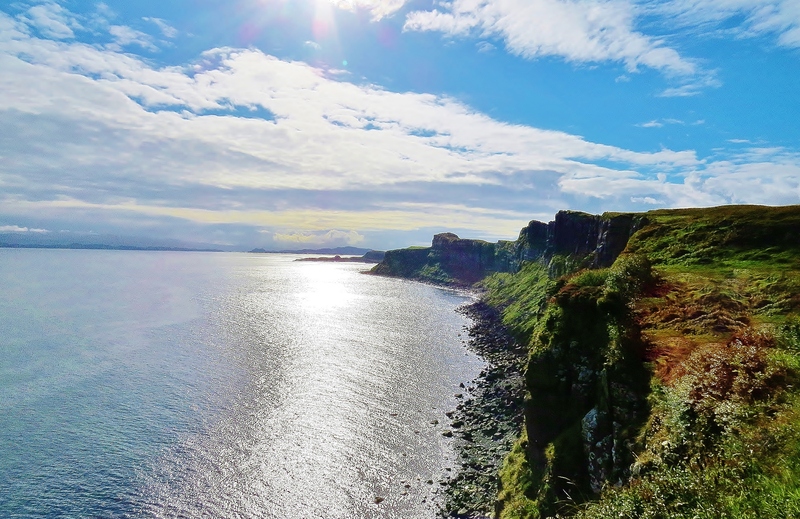 Legend has it that The Giant’s Causeway, situated on Ireland’s NW coast and similarly constructed of basalt staves, was built by a giant called, ‘Fin’, and that Staffa is the other end of what was, 58 million years ago, a tidal highway between Ireland and Scotland. A nineteenth century poet translated the Erse ‘Giant Fin’ as ‘Fingal’. 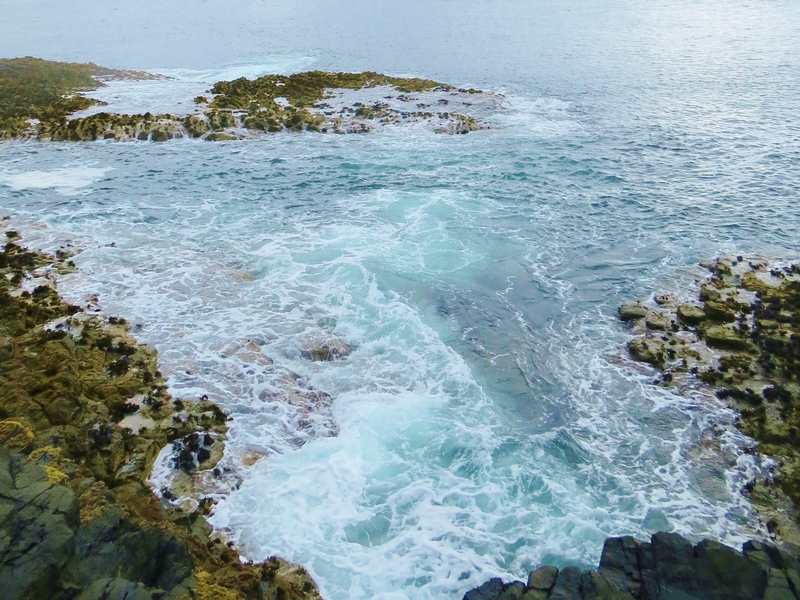 The island is totally volcanic, with the basalt pillars resting on a basement of ‘tuff’, compressed volcanic ash and topped by a layer of volcanic debris and fragments of basalt. Rich, fertile soil now covers the top layer. The pillars are free standing and, over time, salt from the sea water seeps down behind those most exposed, eventually forcing them to break off. 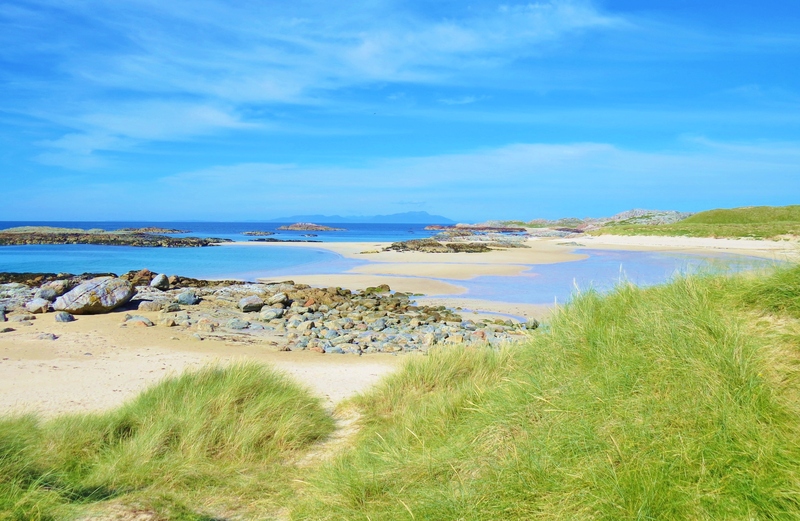 Iona, a neighbouring island has beaches littered with black basalt fragments with pieces being found on shores for miles around. Formed around 58 million years ago, the sheer antiquity of the place is beyond words in the awesome department. For those wishing more complete geological information, there are many suitable sites on the internet. Wikipedia has an informative, interesting collection of facts that is not dry and within the capabilities of non-scientists. Wikipedia was my main source of historical and geological facts. Sounds are reproduced inside the cave and magnified by the acoustics provided by the vast, cathedral ceiling. During my visit, the sea was relatively calm and the water flowing and ebbing inside the cave was untroubled. In spite of this, the glorious music of crashing waves was all around, relayed from an area of turbulence some distance away. 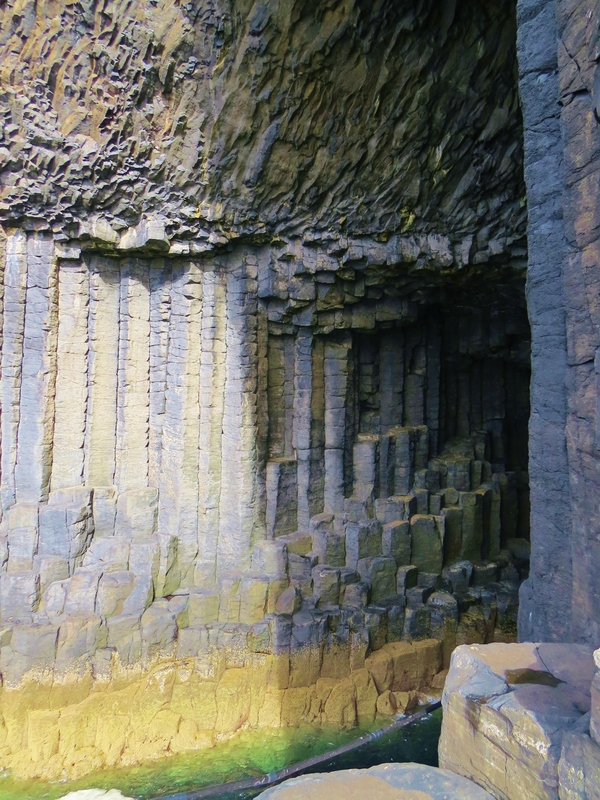 It was too late in the year for the hundreds of migratory birds and large sea mammals to be present in the natural orchestra that plays in Fingal’s Cave, but I hope to return when they do. A handrail on the narrowest part of the path to the cave affords reassurance to nervous travellers. The walk from the boat to the cave is surprisingly easy. The broken pillars,worn down by tides make for pretty level going, the occasional slippery patch being daubed with a non-slip substance. The staves have 3 to 8 sides, 6 being the most common. The following video gives viewers a sense of the timelessness, wild beauty, and awesome grandeur of this tiny, 60 million year old island. 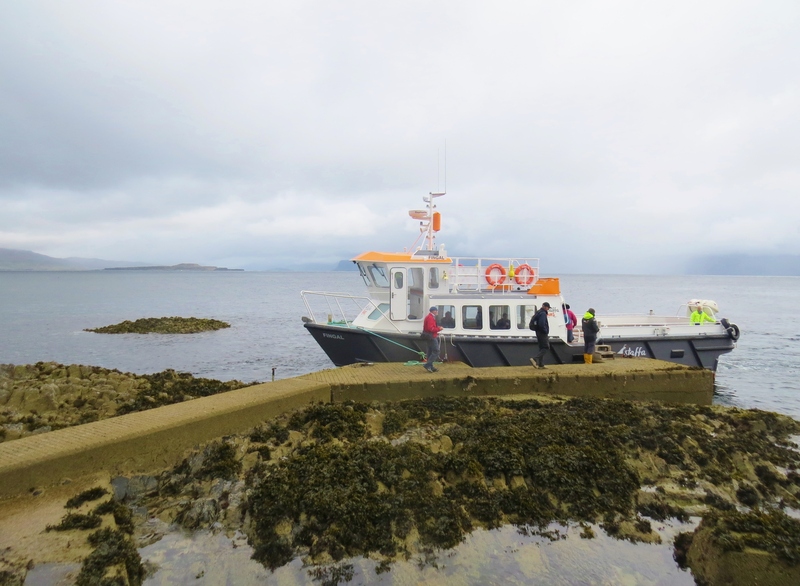 One way to experience the Isle of Staffa is to take a trip on the Caladonian MacBrayne ferry from Oban to the Isle of Mull, then join the Staffa Tours boat after a scenic drive the length of that island, as I did. 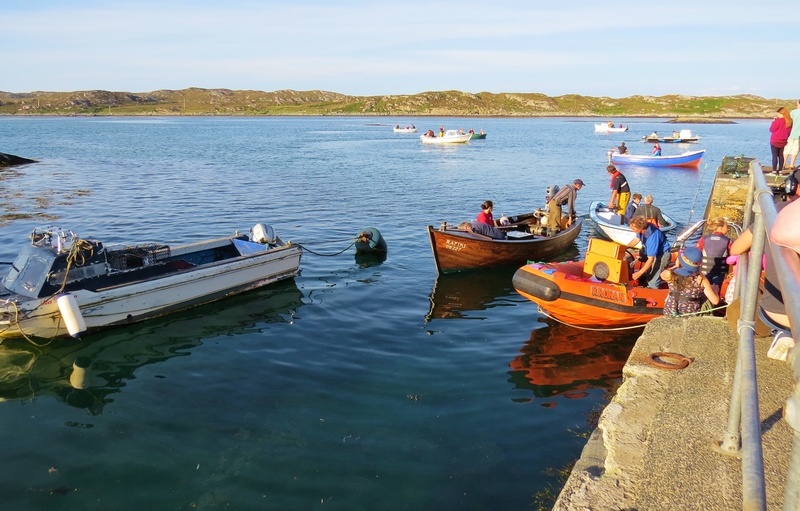 After an hour on Staffa, the small tour boat takes passengers to the Isle of Iona, there to spend three hours exploring before a return journey on the CalMac ferry to Mull and from there another ferry back to Oban. 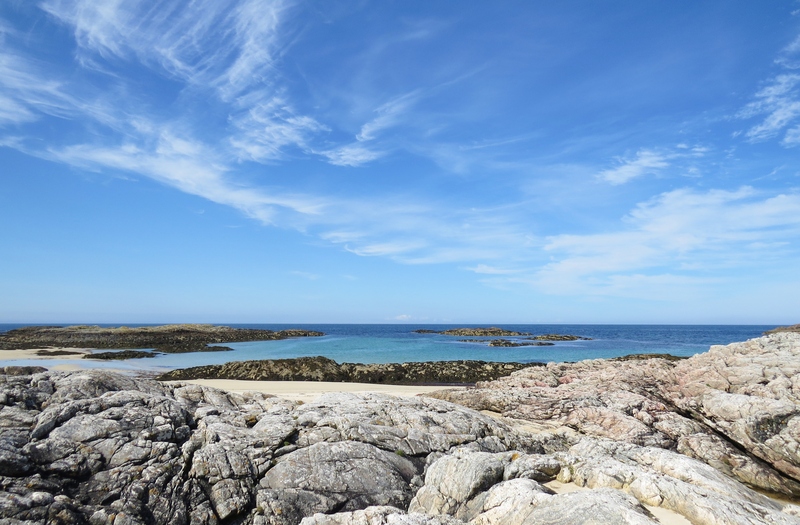 From Staffa we sailed 7.4 miles South to the Isle of Iona. Although such a short distance apart, like all the islands in this group, the difference between these two islands is unbelievable. 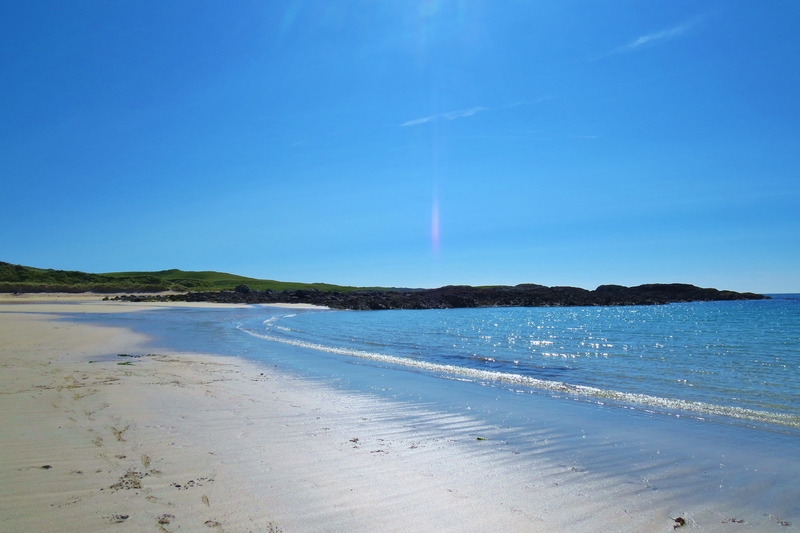 More than feeling like a change of country, after Staffa, Iona felt like a different planet. Water lapped gently on silver beaches, creating softer, gentler music than the cocophany on the basalt rocky island we had just left. Small boats bobbed in the harbour and, away from the waterfront, sheep grazed and flowers bloomed. 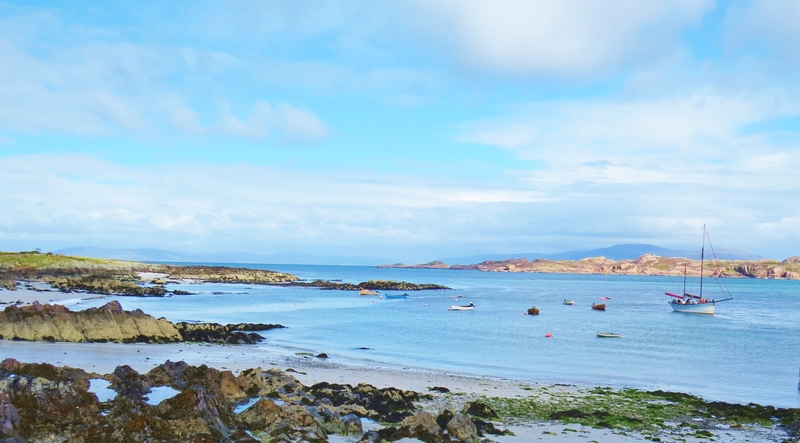 After approaching Staffa surrounded by dark water and under glowering skies, we sailed into Iona’s harbour in a world of gentle blue and turquoise. A land of enchantment, Torridon is situated in Wester-Ross, the most westerly area of Ross-shire in the Western Highlands of Scotland. 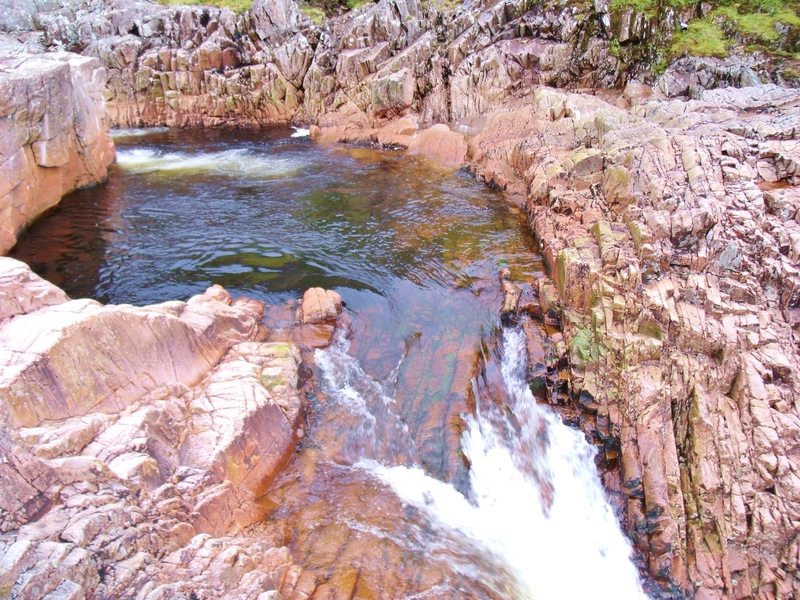 Although it is neighbour to Sutherland, the physical features of Wester-Ross are markedly different. And now, a very short, magical video. 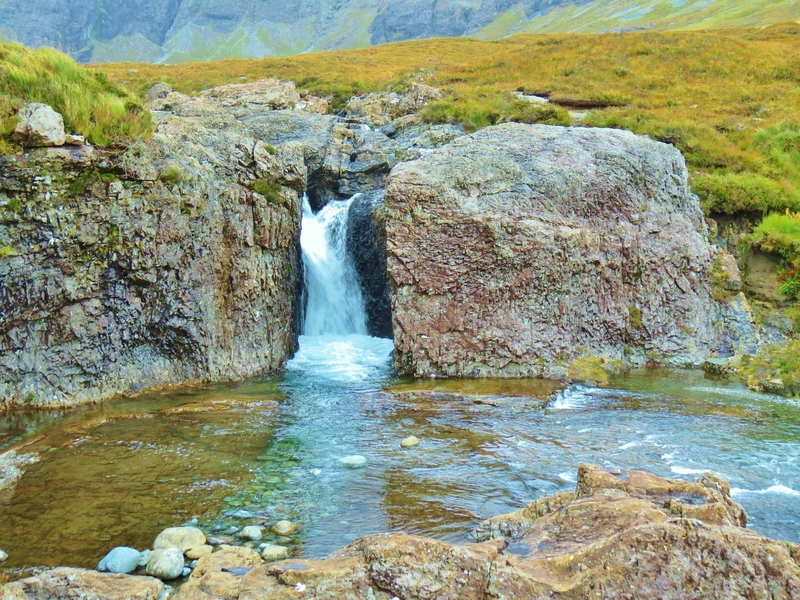 Torridon has the most dramatic scenery in the area and, while sharing the tragic history of Sutherland, there are unique and surprising historical episodes in Wester-Ross that haunt the landscape still. 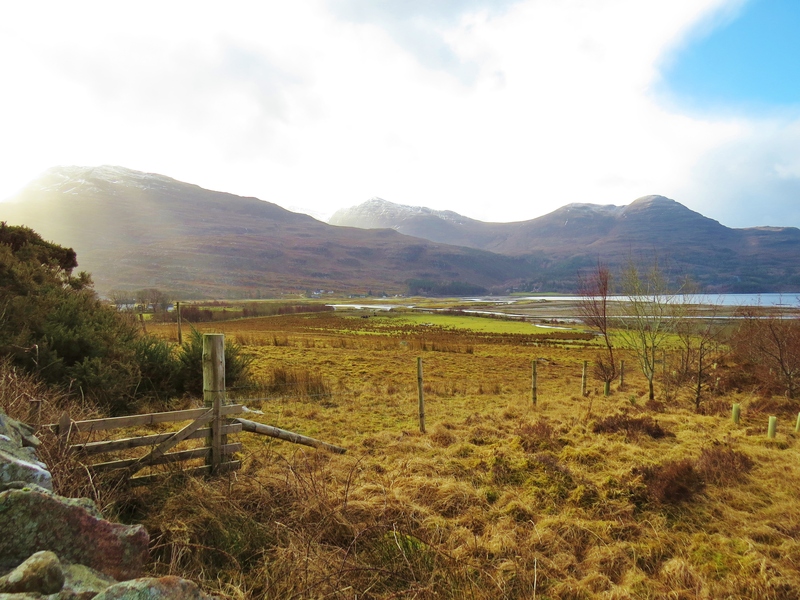 Torridon is situated at the head of salt water Loch Torridon, a sea inlet which washes the fields and grazing land at high tide, far inland from the sandy beaches exposed when the tide is out. 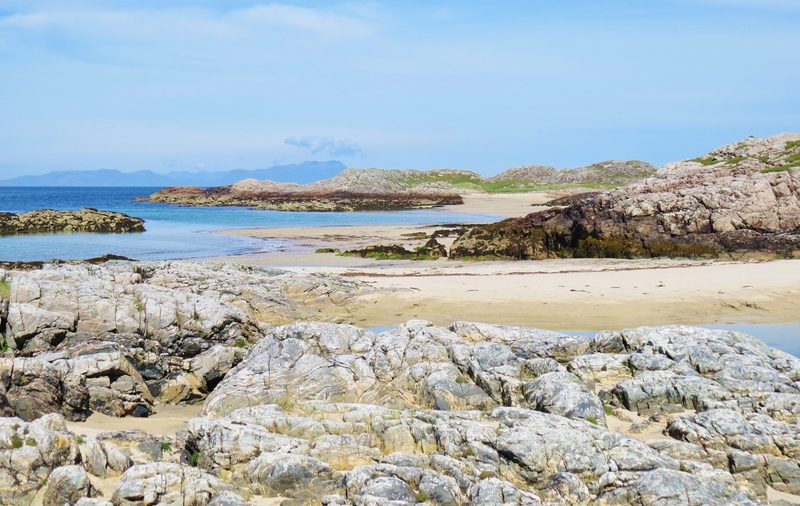 As well as sandy beaches, low tide reveals interesting stone formations and tide pools. 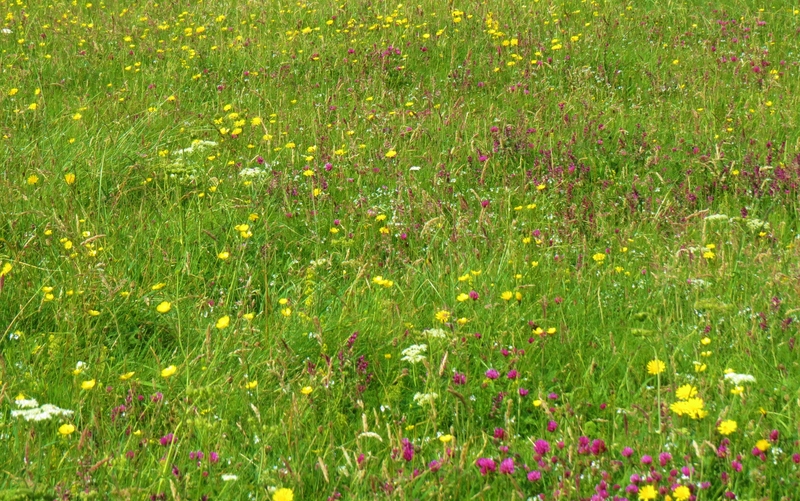 While crops are few, grazing for cattle and horses is adequate, if not abundant. 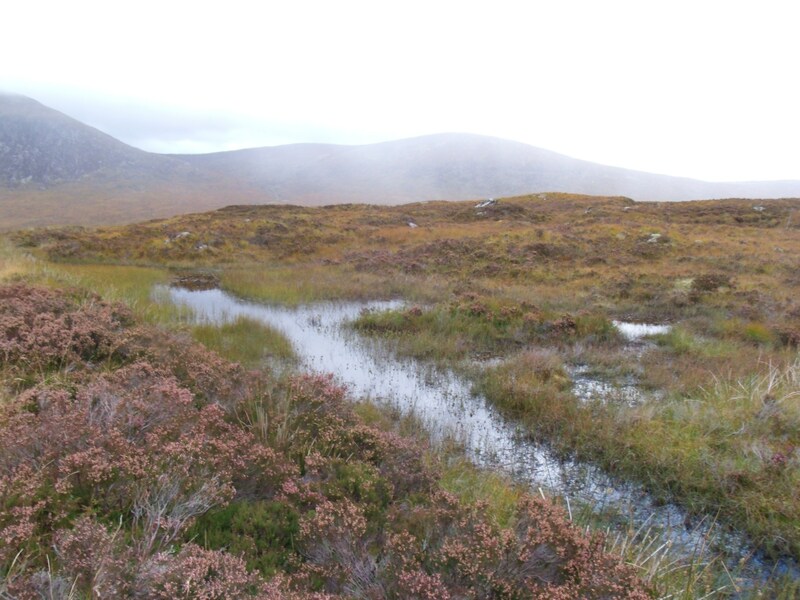 Unlike Sutherland and most other places in the Highlands, there are no sheep to be seen. Past history accounts for this. 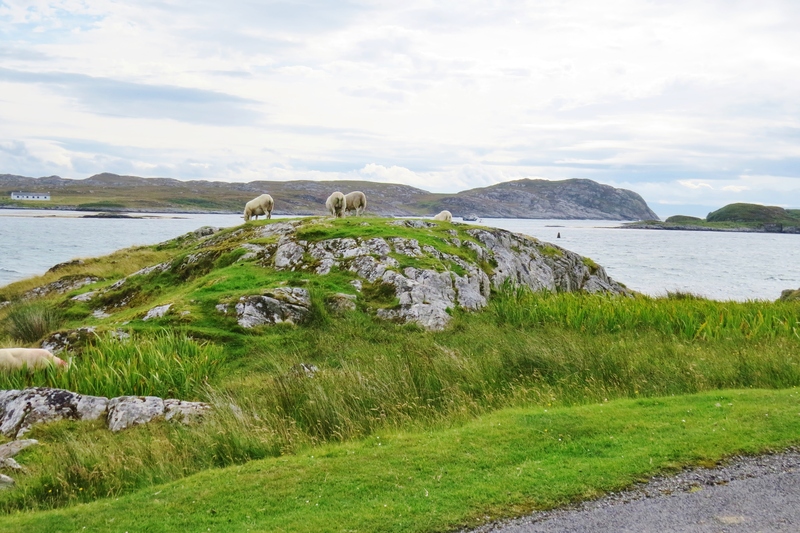 Like the rest of the Highlands and islands, Ross-shire suffered the ‘clearances’, a disgraceful episode in Scottish history when all of the Western Highlands and islands were cleared of people to make way for sheep. Land owners forcibly removed there tenants from the crofts they relied on for their existence, often herding them on to ships and transporting them to colonies, mainly Canada. Croft houses were demolished and sheep, believed to be more profitable, were brought in. 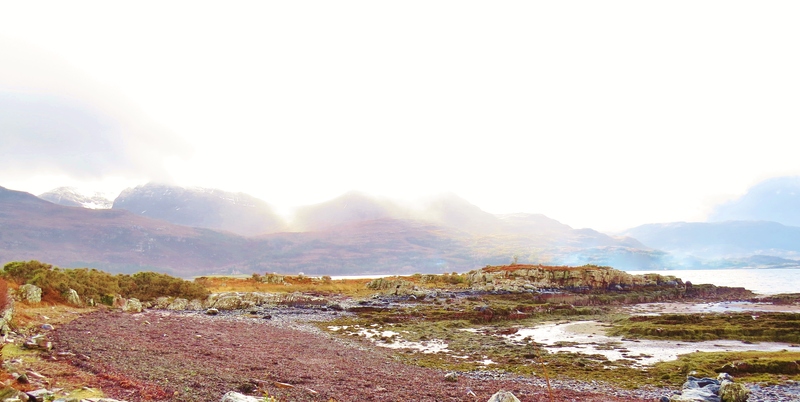 Wester-Ross, particularly Torridon, endured some of the worst suffering. In 1831, the area, then a single estate, was purchased by a Colonel Burnet. This ruthless businesman had made his fortune by exploiting plantation workers in Jamaica. 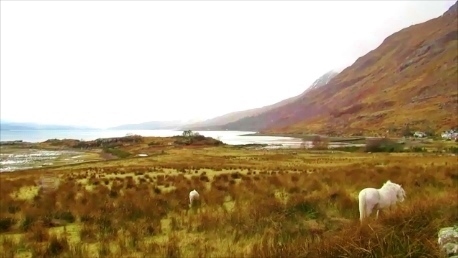 The details of his crimes against the crofters in the area is well documented by Steve Carter, Historian, suffice to say, the crofters in Torridon were contained rather than cleared – crammed together in abject poverty, forbidden from keeping livestock of any kind and only allowed a tiny plot on which they could grow potatoes. 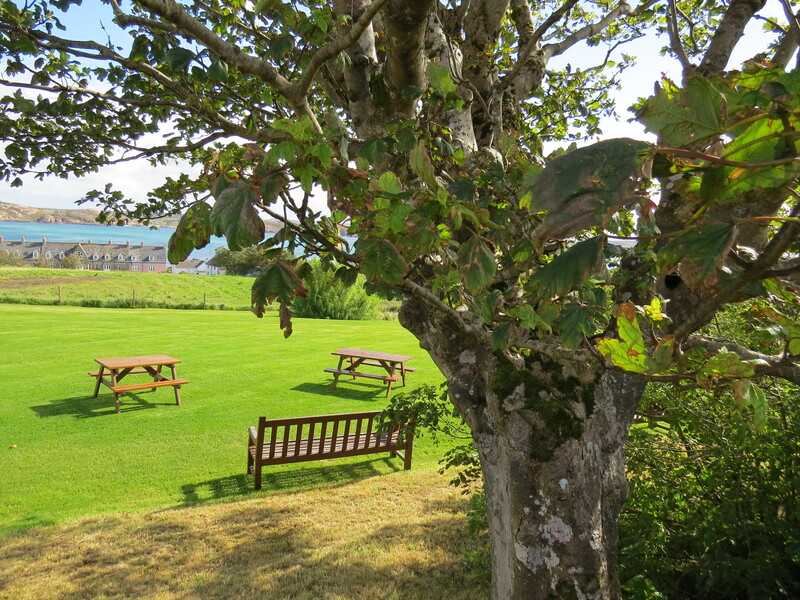 For decades, this state of affairs continued until the estate was bought by Duncan Garroch of Gourock. This business man was also a philanthropist. 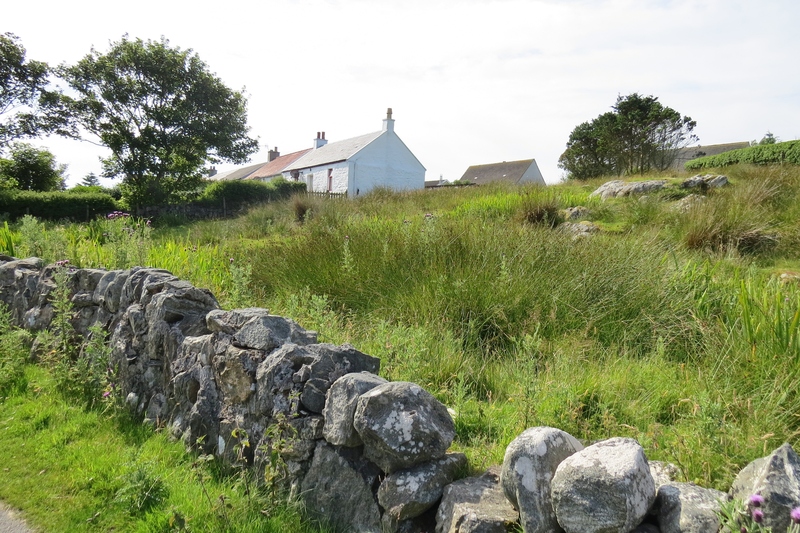 He returned the land to the tenants; got rid of the sheep and replaced them with a deer forest; built walls and fences to keep the deer off the tenants land; allowed the tenants to keep livestock; encouraged them to harvest seaweed to use as fertiliser, a practice formerly forbidden; gave them access to peat bogs and even provided loans so they could buy livestock or build boats. 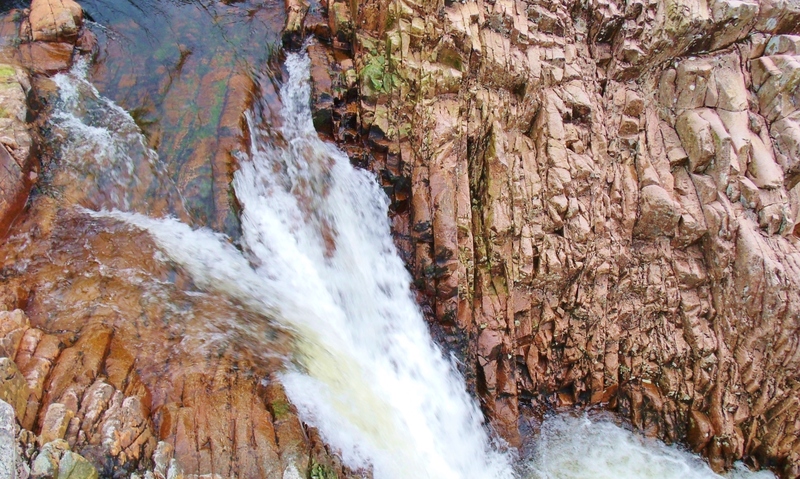 The area is a geological treasure, the red sandstone, at times overlaid with white quartzite being among the oldest rock in the world, some 250 million years old. The ancient red sandstone and white quartz are evident among the variety of rock types in the many mountains that ring this ancient basin. 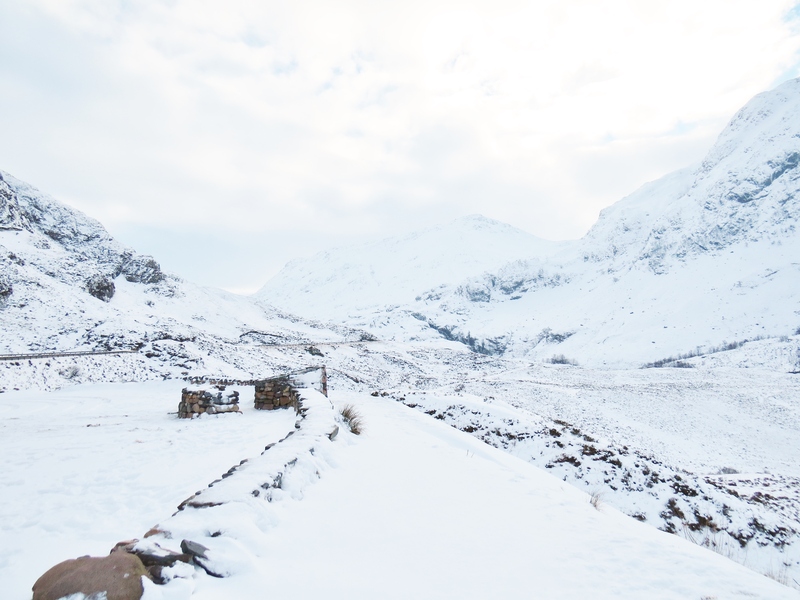 The many, many mountains surrounding Torridon make this a favourite year round getaway for serious climbers as well as scramblers, hill walkers and hikers. 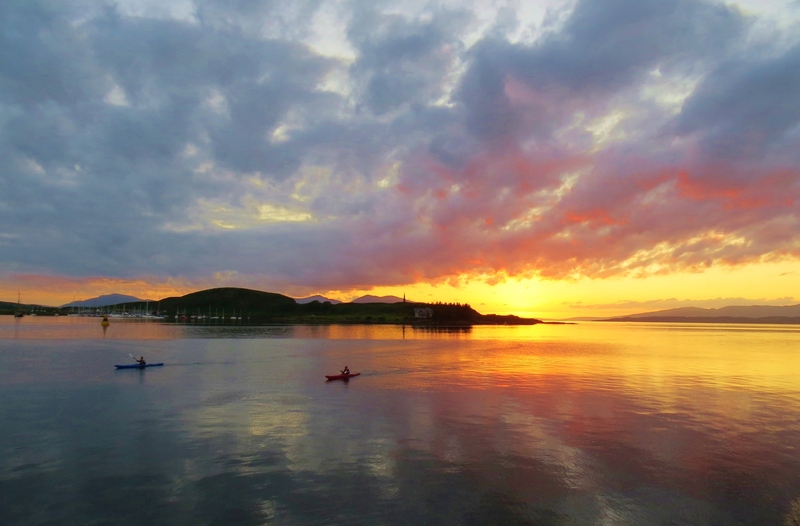 Kayaking and fishing also attract many visitors. 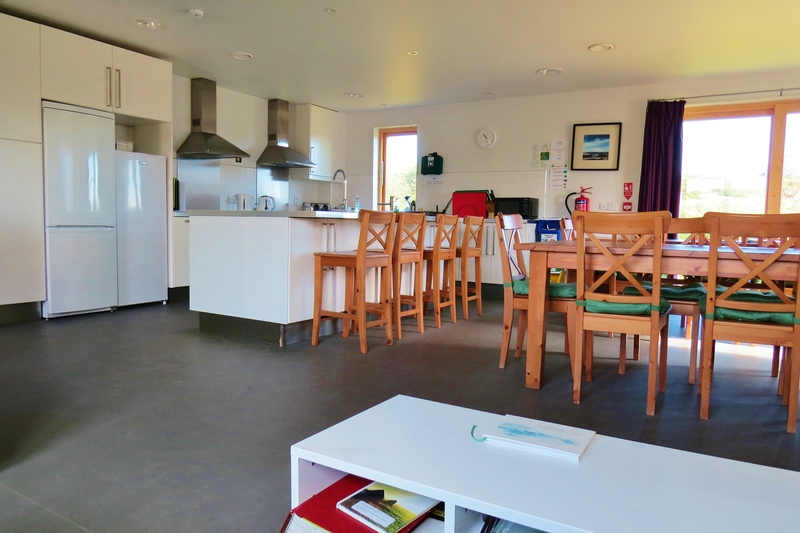 The Torridon Youth Hostel definitely deserves five stars. It is large, airy, beautifully furnished and has a warm, welcoming, relaxing vibe. 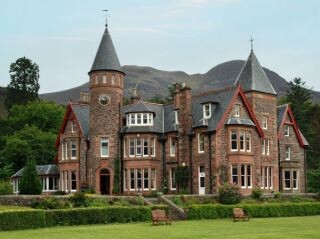 For those wishing more opulent accommodation, the Torridon Hotel offers that and much more – and therein hangs a tale. 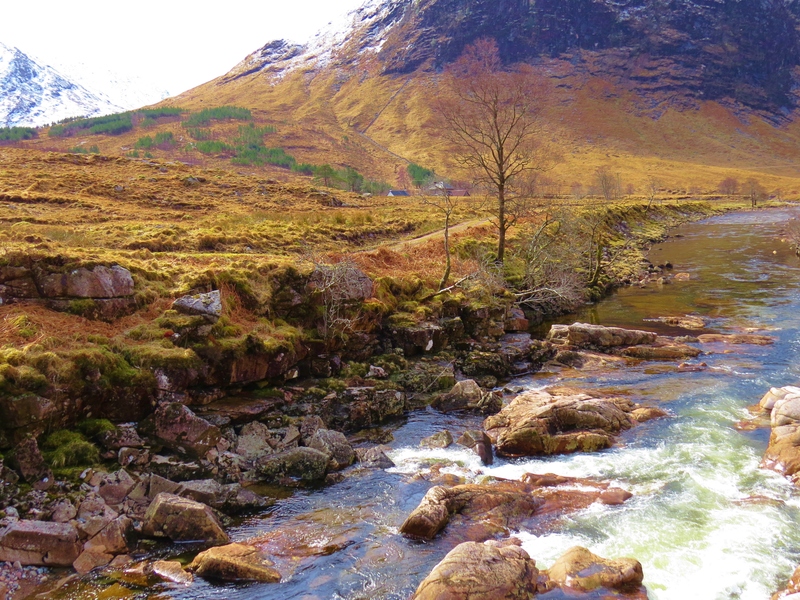 Annat is divided from Torridon by the River Torridon. 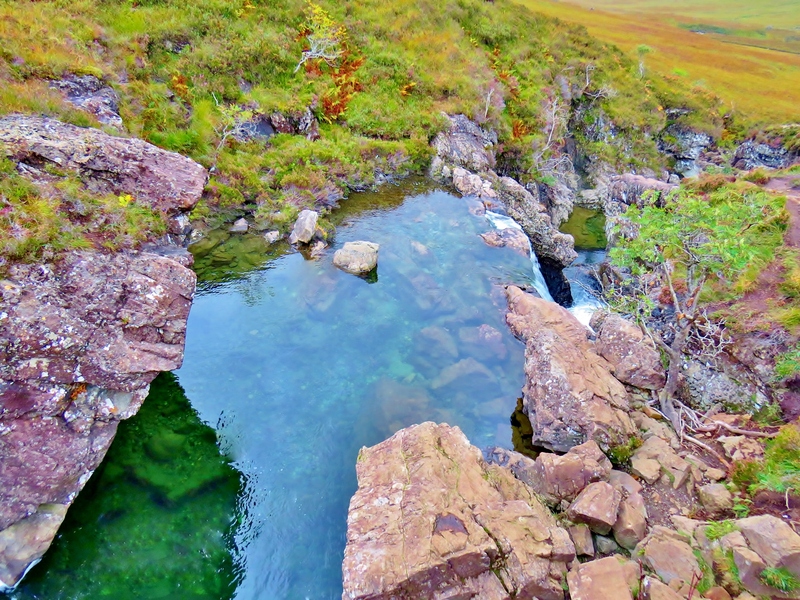 A bridge across the river connects Torridon and Annat. While Duncan Garroch owned the estate, he sold 59 acres to the Earl of Lovelace. 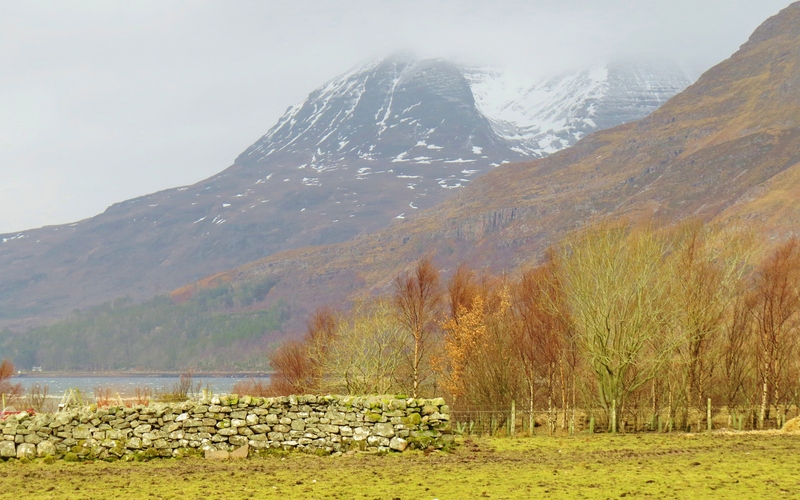 This acreage was a half mile or so from the river on the Annat side and here the Earl built Torridon House, now the Torridon Hotel, still surrounded by the beautiful landscaping laid out by the Lovelaces. The Earl’s wife was Ava, the only legitimate daughter of Lord Byron, famous poet. Ava Lovelace, born in 1815, was remarkable in that she was a gifted scientist and mathematician who helped Charles Babbage, the foremost mathematics authority of his time, create the Babbage Engine, the very first computer. Ava is credited with writing the first computer programme. 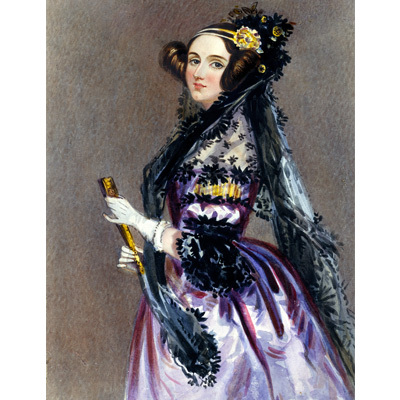 The international ‘Ava Lovelace Day’ celebrates women in technology. She and the Earl lived in Torridon House until her early death in 1852. While Ava’s public life as a scientist and math expert are well documented, of her life and habits at Torridon House little is known. 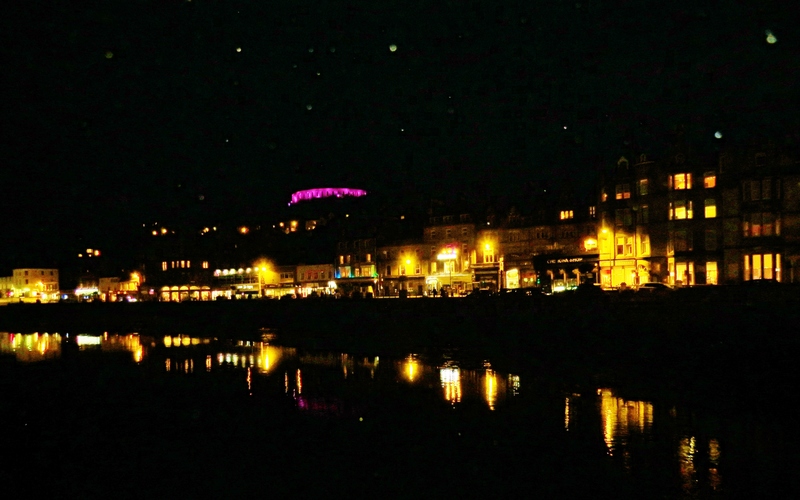 How to get there: Take the earliest Inverness train from Glasgow. Change at Inverness and take the train heading to Wick. 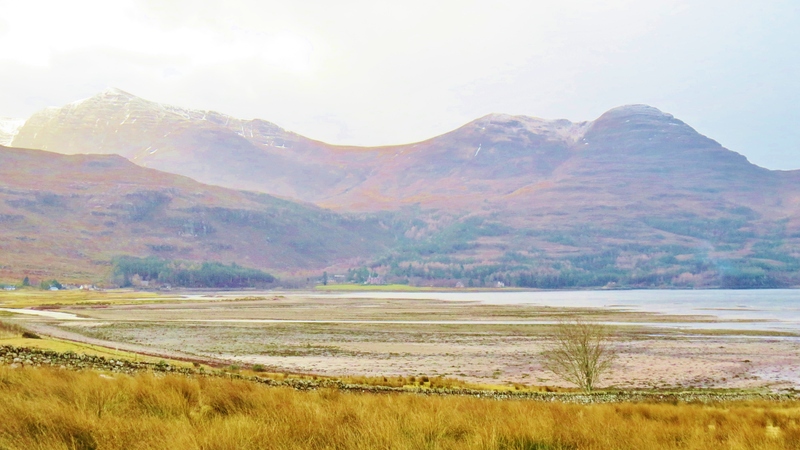 Alight at Strathcarron and get the minibus that meets the train and goes to Torridon. there is only one bus a day, so getting the earliest train is essential. Booking your journey in advance is recommended. Note: For a comprehensive history of the area go to: Steve Carter’s web link in side bar – Torridon and Sheildaig – a historical perspective. 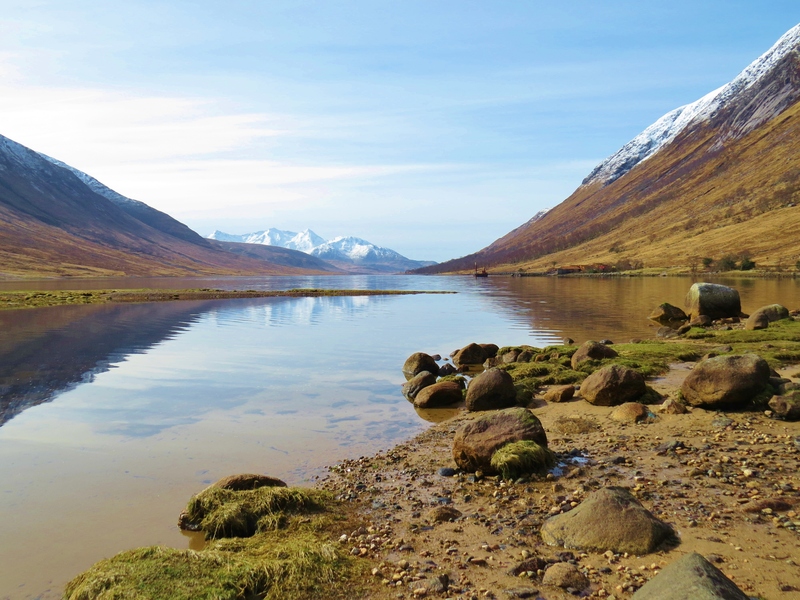 Trivia: According to Steve Carter, Historian, ‘Records show that Queen Victoria loved to travel the road between Torridon and Diabaig’. 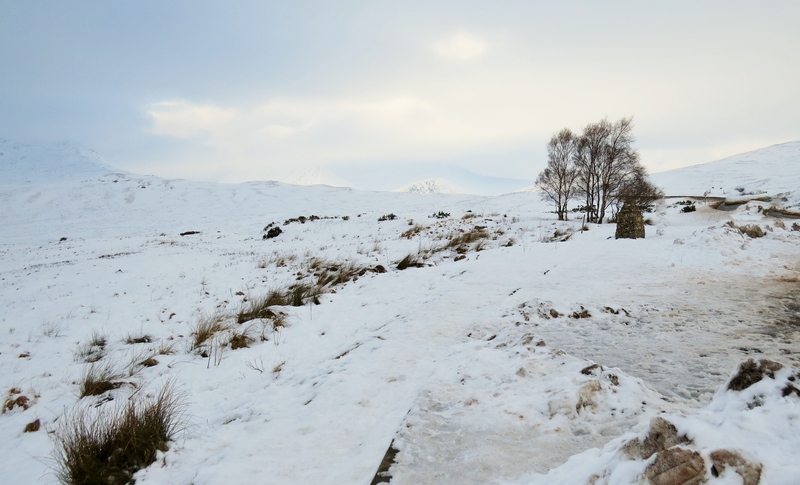 Joyful Journey: Part 7 – Winter in Glencoe, Rannoch Moor, Loch Leven. 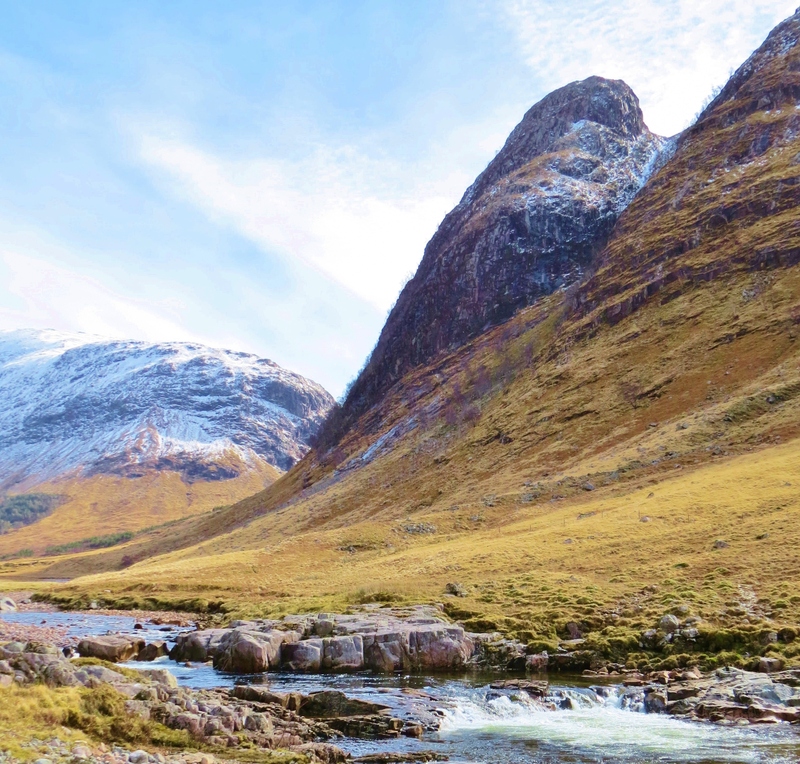 Born of fire and ice, Glencoe is an area of mountains, hills, lochs (lakes)and glens (valleys). Volcanic action formed the wild, rocky terrain, with movement of the earth’s plates later crushing the rocky surfaces together to form rugged hills and mountains. 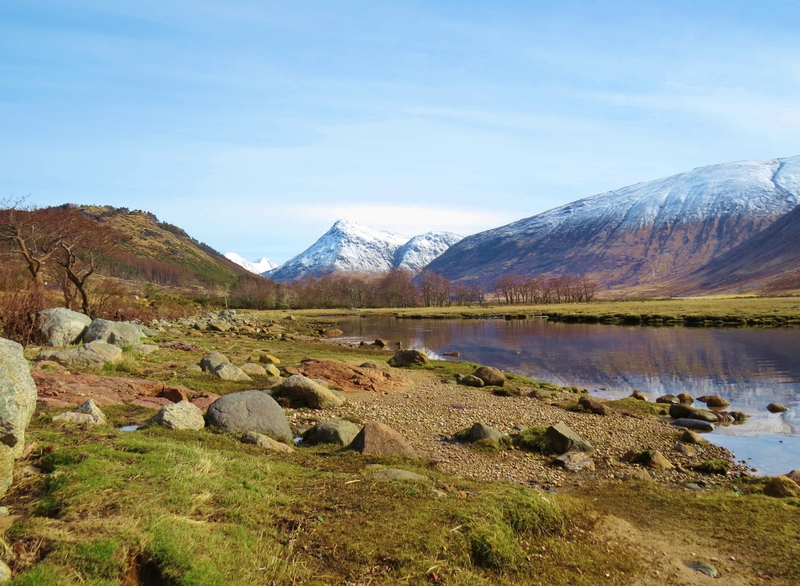 At the end of the ice age, the huge glacier that sat atop what is now Rannoch Moor, moved, as it melted, gouging out Glen Coe and creating a network of valleys and depressions where lochs (lakes) formed. But along with the scientific facts and the geological history which produced the amazing results evident today, there is an undeniable, other-worldly aura about this place. 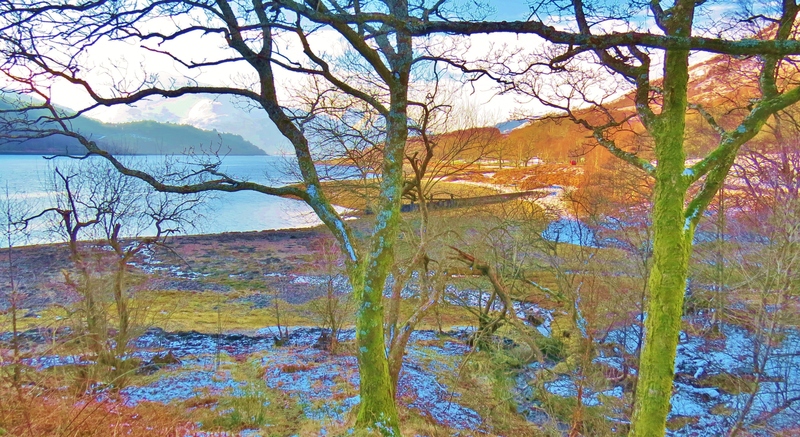 The shores of this fresh water, inland loch within the glen are littered with rocks of subtle colours, giving, even a snowy winter lanscape, the warmth to prevent bleakness. 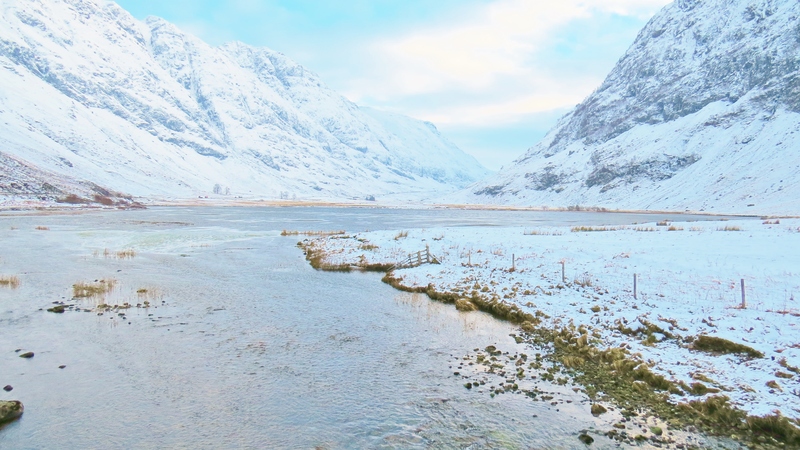 Glencoe has a tragic, bloody history that adds to the air of eerie desolation often felt here and has earned it the title ‘Glen of Weeping’. 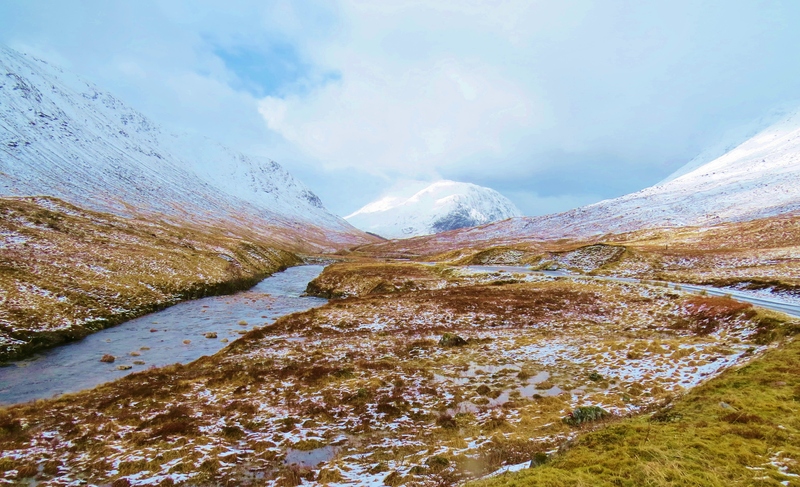 In the winter of 1692, a massacre took place, during which, most of the Glen’s inhabitants were murdered as they slept, while others fled to the hills and died from exposure. 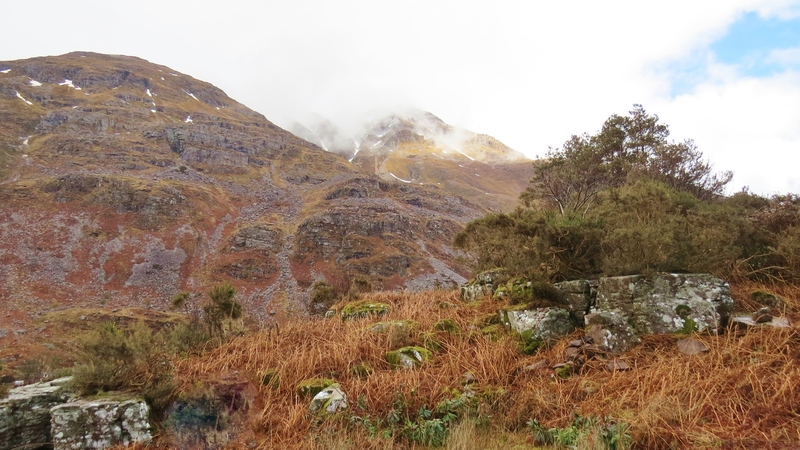 It was a shameful act of betrayal and butchery against the Macdonalds of Glencoe, ordered by King William III, crafted by John Dalrymple, Master of Stair, and carried out by a member of the king’s army, Captain Robert Campbell of Glenlyon. 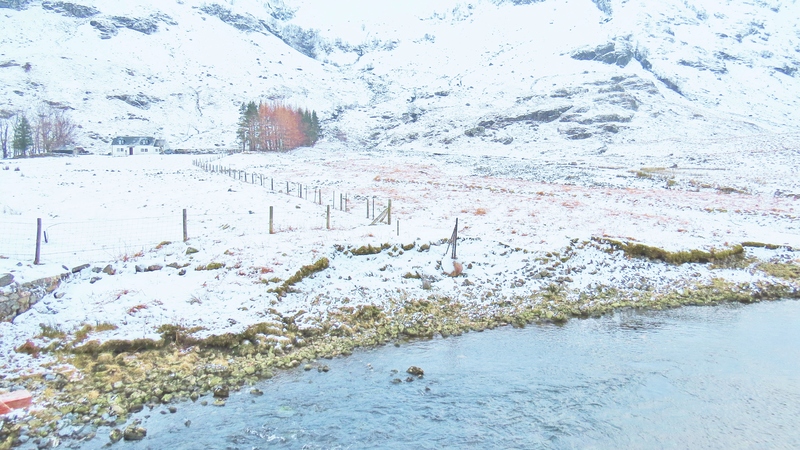 Many people believe that the spirits of the victims still inhabit the Glen and can be heard crying and wailing, especially on February 13th, the anniversary if the slaughter. 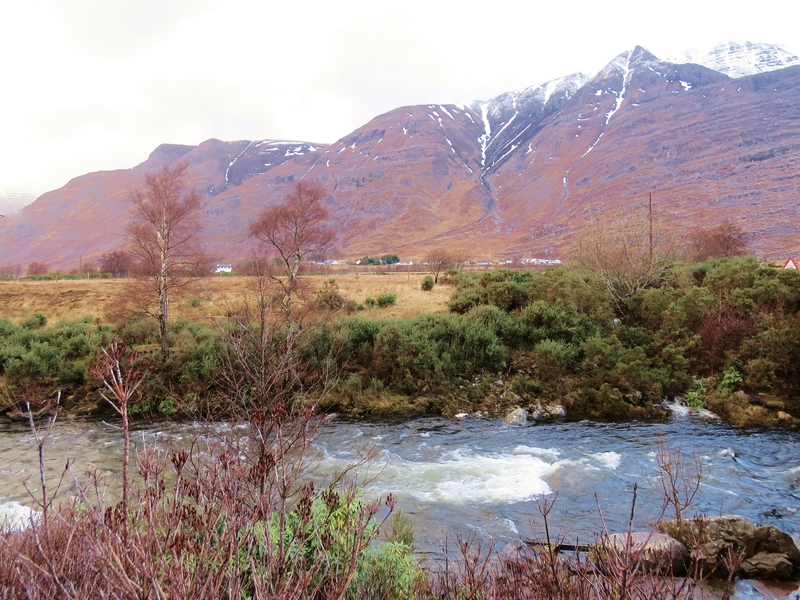 That is not the only way Glencoe presents itself, however. It has many faces. I caught it in one of it’s rare, gentle moods. Most often it is known as a place of great beauty and grandeur, but mist shrouded, desolate and eerie much of the time. (See ‘Joyful Journey, Part 2’) For many, like myself, it is loved in all its moods. 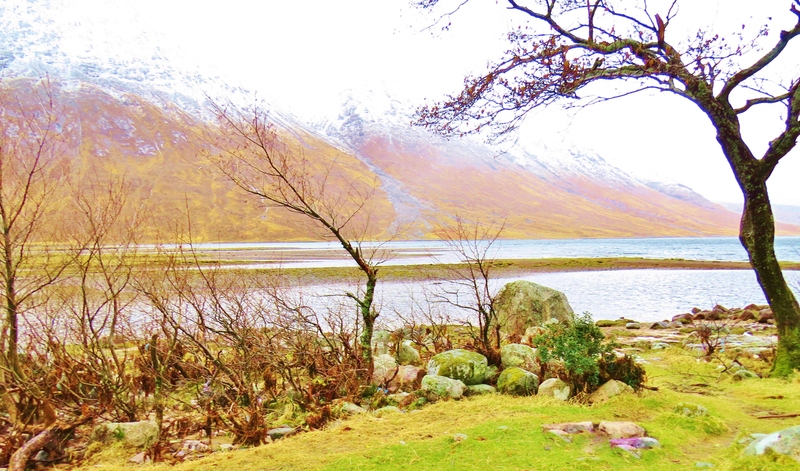 An inlet from the Atlantic forms the salt water, tidal, sea loch known as Loch Leven. 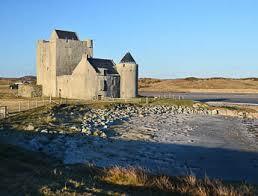 It has a varied coastline, from wooded to slate-covered as in the photo above. Note: Due to icy road conditions, on this visit, I had to keep to roads more travelled. 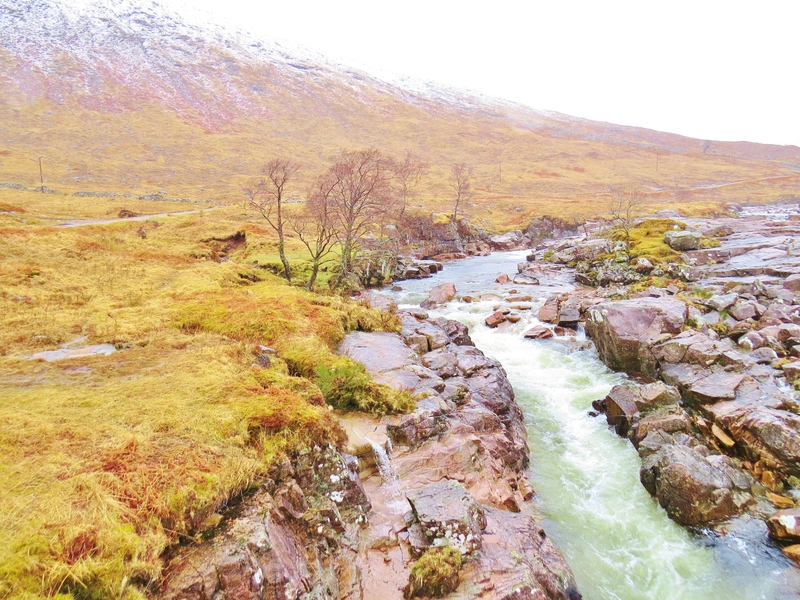 As a result, the photos contained in this report show mostly the edges of Glencoe. 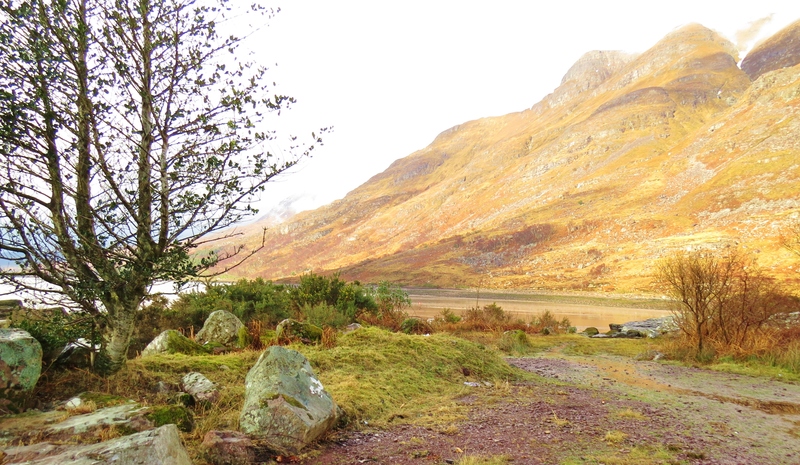 Once the back roads are safe and open, I will return to record the heart of the glen. 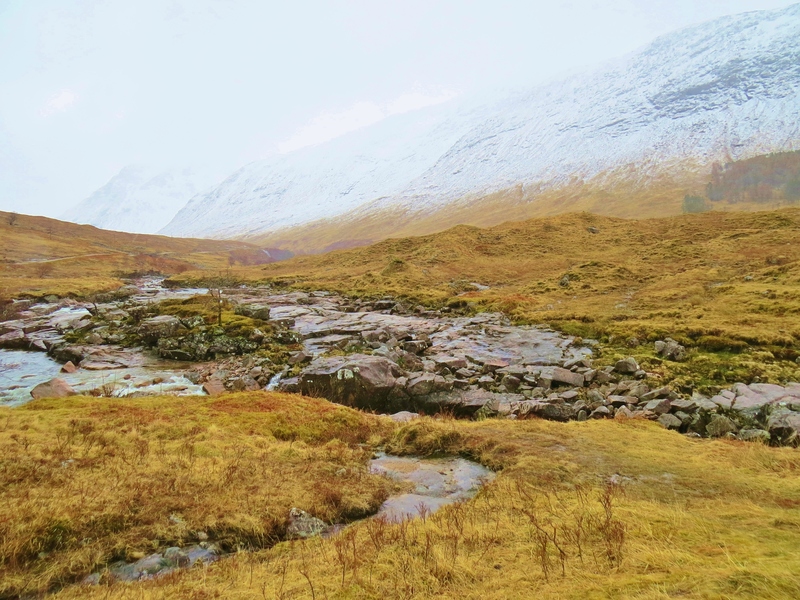 The floor of Glencoe has areas fertile enough to support a few crofts. (small farms). 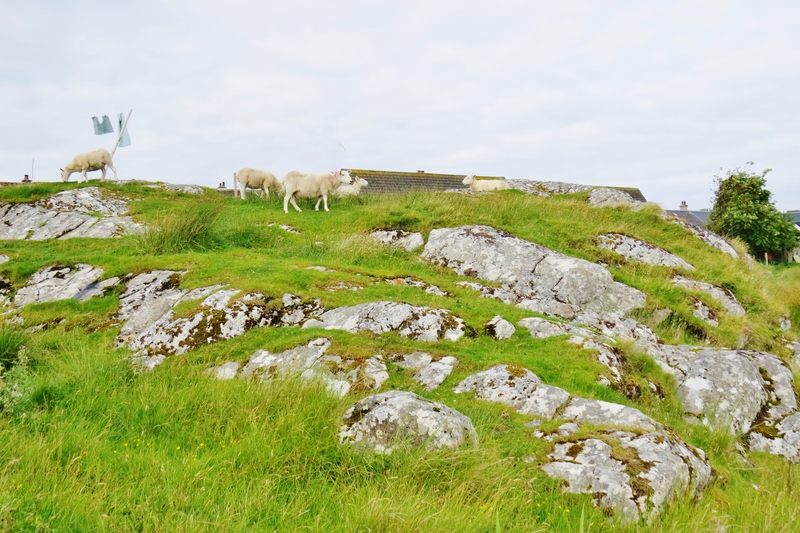 Arable land is in short supply but sheep graze on hillsides and grassy fields. 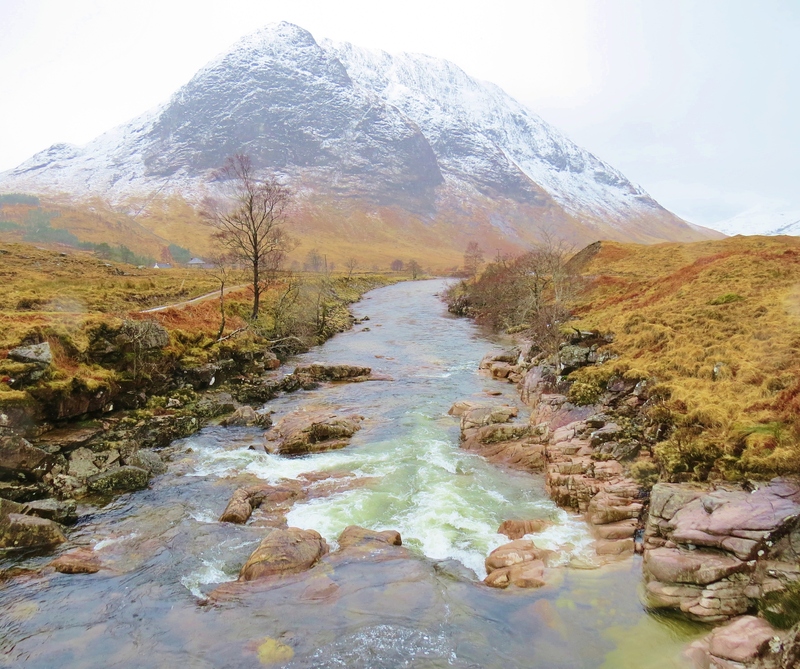 Glencoe is not known for its gentleness, however. At their worst, the hills and mountains are death traps. Weather conditions change without warning, the capricious nature of wind, rain and cloud seemingly bent on catching the unwary. Experienced climbers have perished, lost while challenging elements and terrain that draw them like magnets. 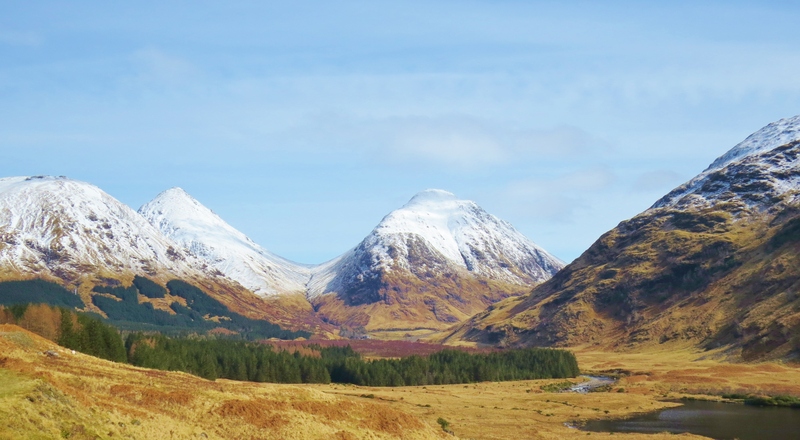 Even the stubby, non-threatening-looking hills known as ‘The Three Sisters’ must be treated with respect. 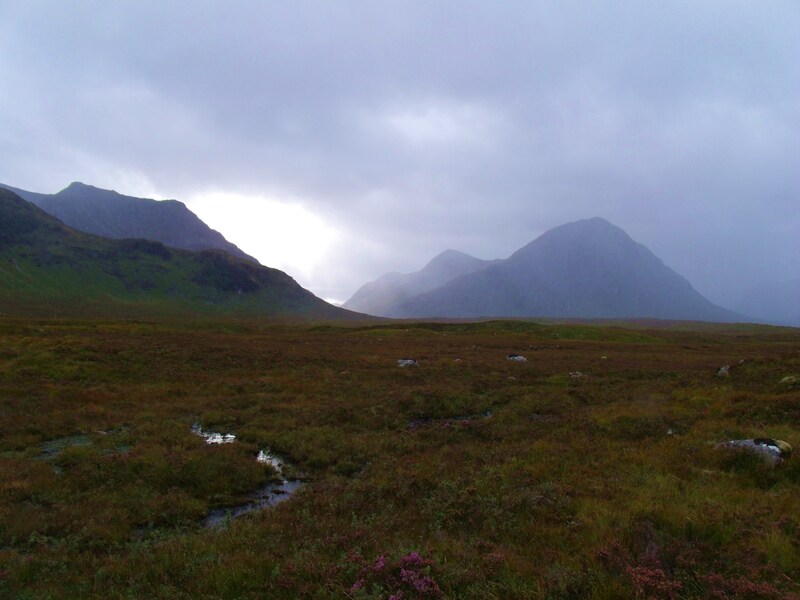 Glen Coe is situated beside and below Rannoch Moor, a vast, wild, ancient unspoiled area of peat bogs and lochans. 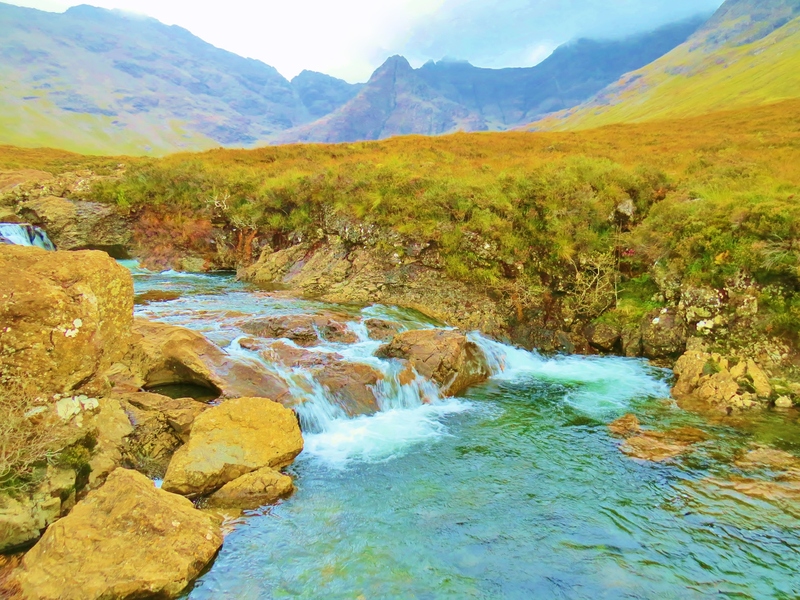 Like the glen, closely attached to it both geographically and geologically, it is loved and hated. 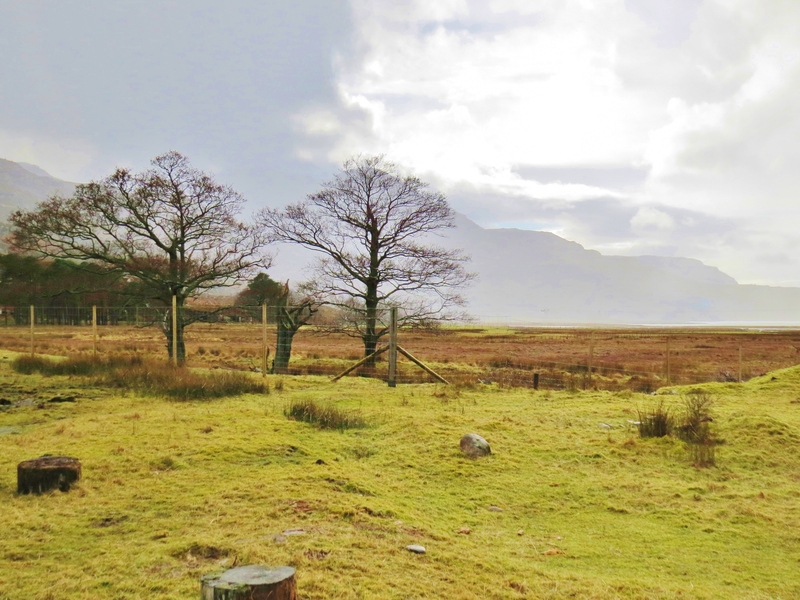 Desolate and threatening in bad weather, inviting-looking when the sun occasionally shines, always deadly for anyone trying to traverse it over anything but the one road and few pathways available – a glorious prehistoric adventure. 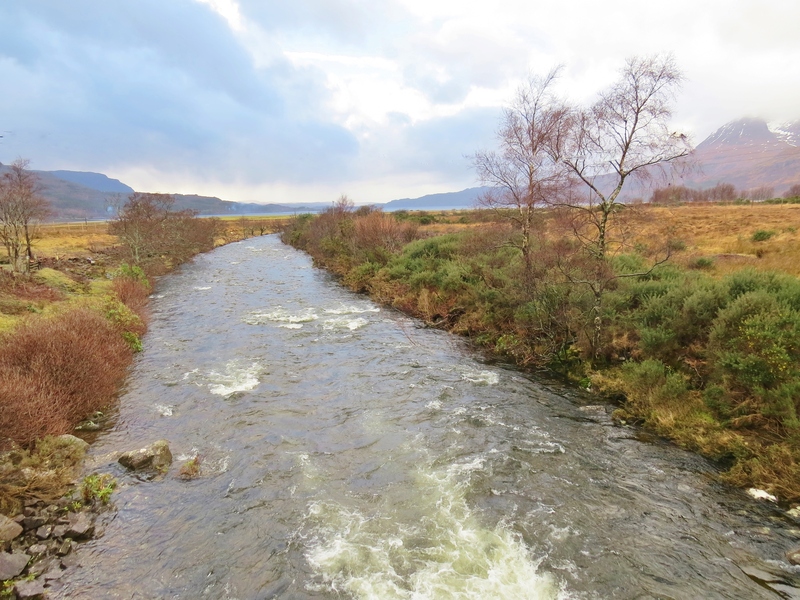 (See ‘Joyful Journey, Part 3′ for images and details of Rannoch Moor). 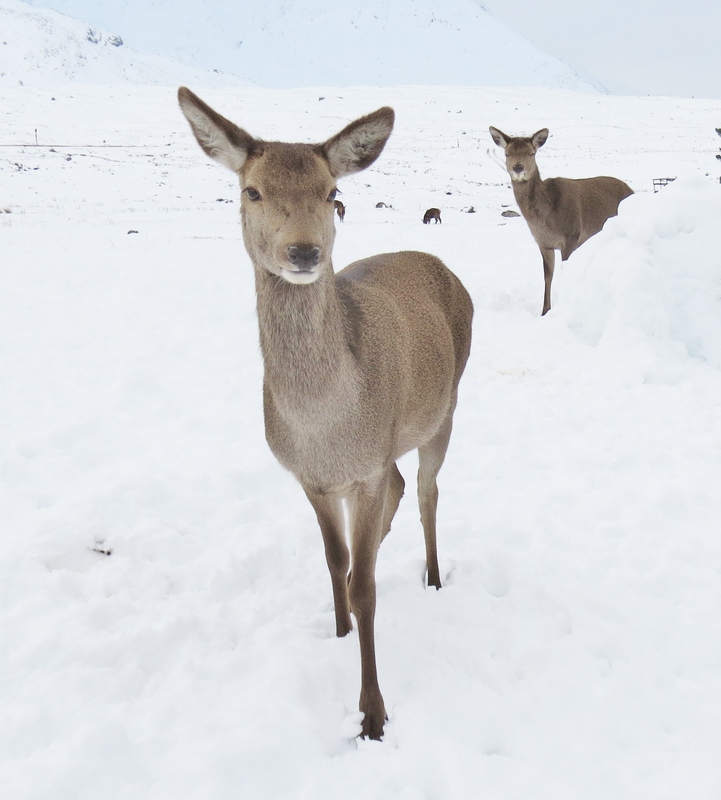 Close to Glencoe, at the Glencoe Mountain Ski Resort, modern activities prevail in the wilderness. 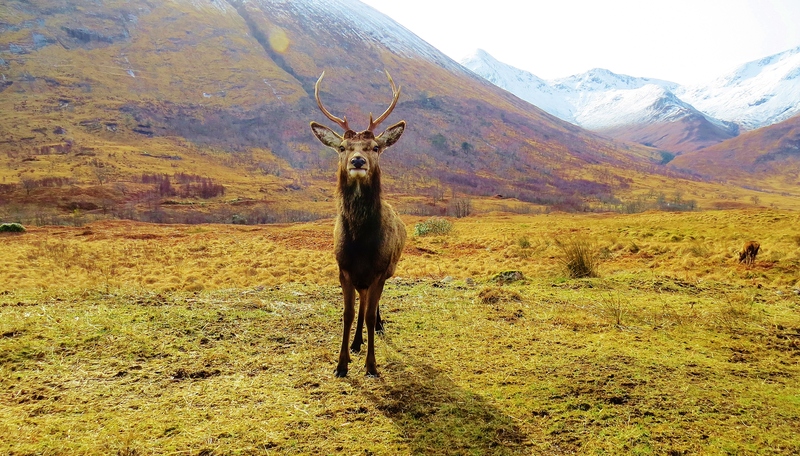 While Rannoch Moor and Glen Coe are almost devoid of creature comforts, the surrounding area has a fair supply of accommodation and facilities. 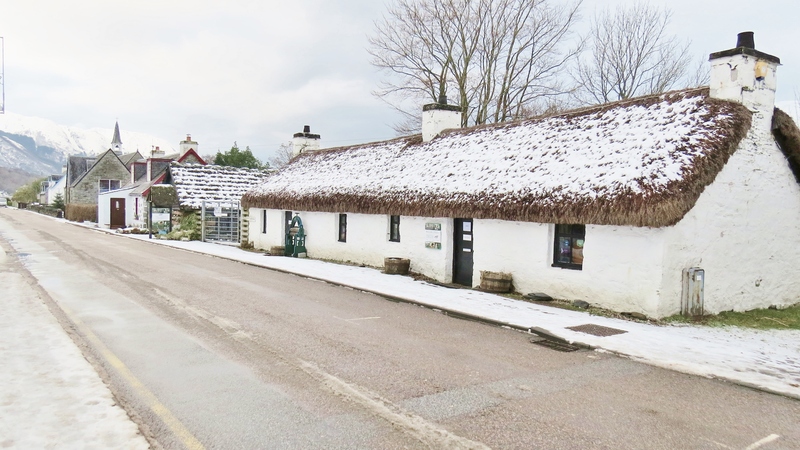 Glencoe village boasts a shop, café and several assorted businesses. 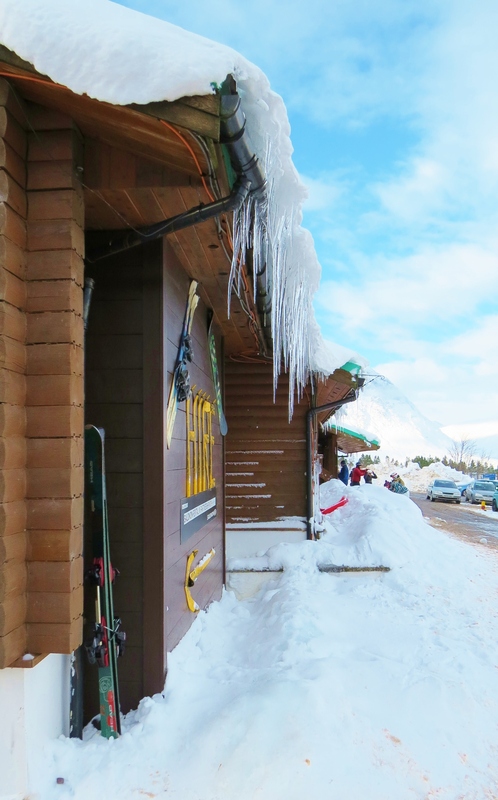 Two hostels cater to the outdoor types while a hotel at Glencoe Village offers more luxurious quarters. 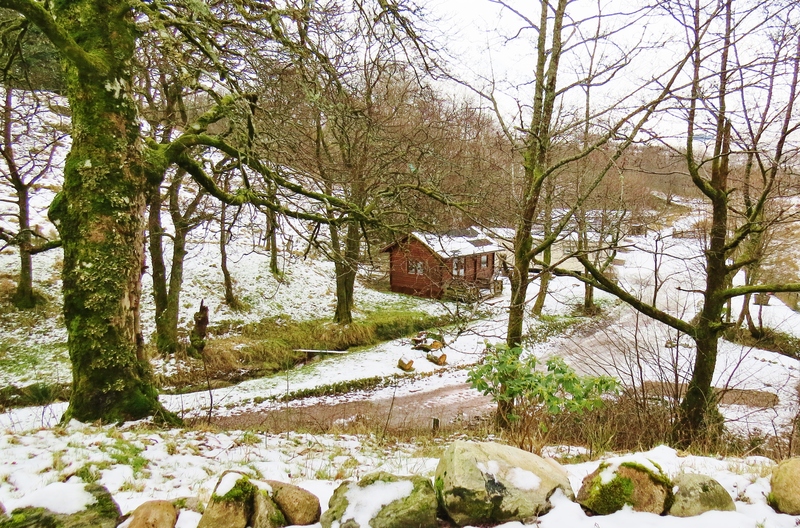 I stayed in Glencoe Independent Hostel’s cosy wood cabin and highly recommend it. 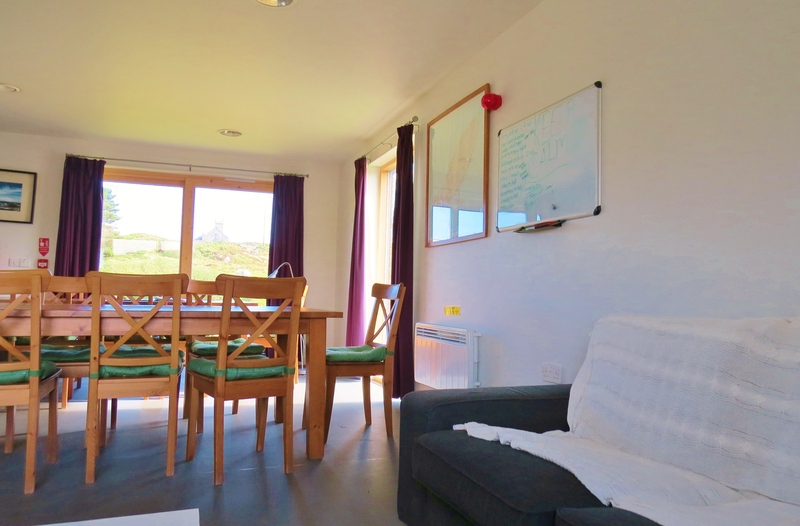 Apart from the hostel, there is a sleeping barn, cabin and several caravans to choose from. The business is owned by a delightful young couple, Keith and Davina Melton who maintain a relaxed, welcoming atmosphere. Proprietor, Keith, also runs GoGlencoe, a guiding business. Without his help I would have been unable to take the photos featured in this report. With his intimate knowledge of the area, he guided me to places I requested and others he recommended. He also drove me to the best viewpoints, given the icy conditions. 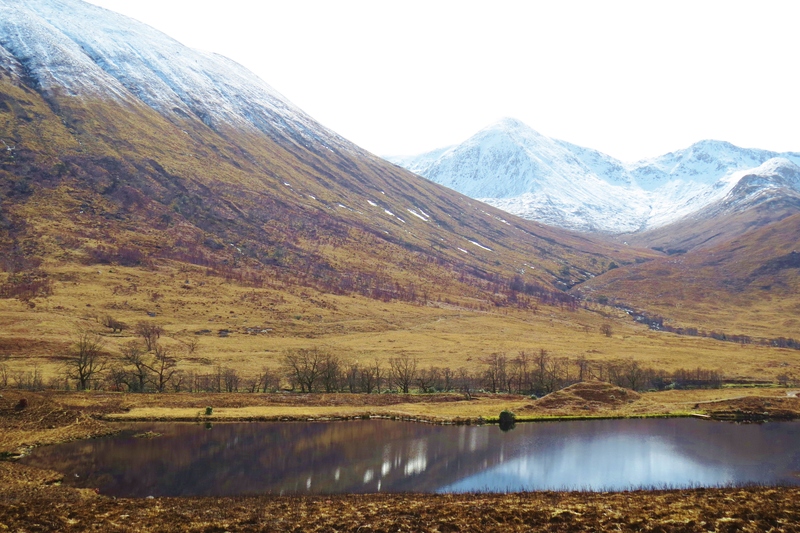 I plan to go back when the back roads and lanes are clear to explore the heart of the glen, again, with the help of GoGlencoe. 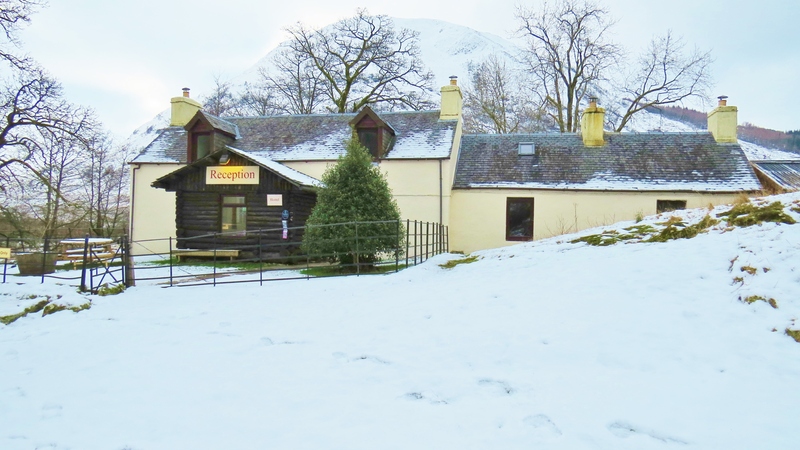 The ski centre at Glencoe Mountain also has accommodation – chalets – and a good sized restaurant. It is open year round. 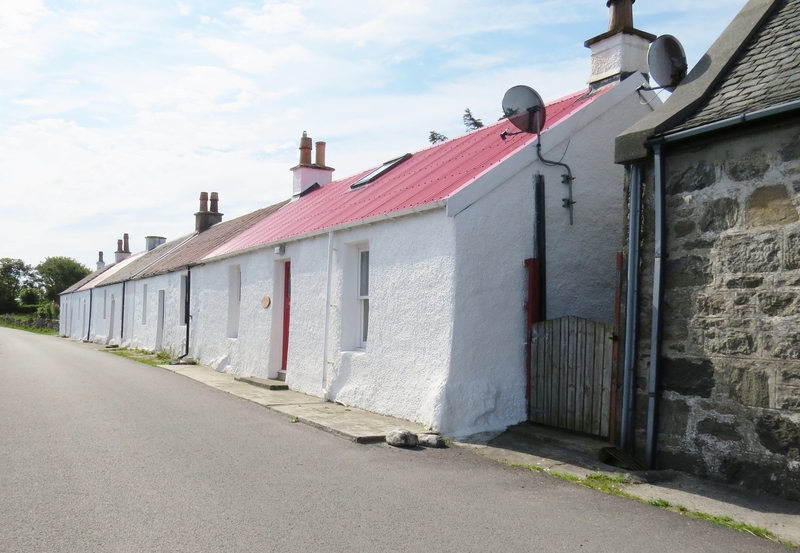 There is also a SYHA hostel, The Glencoe Youth Hostel, a short distance from the Independent. 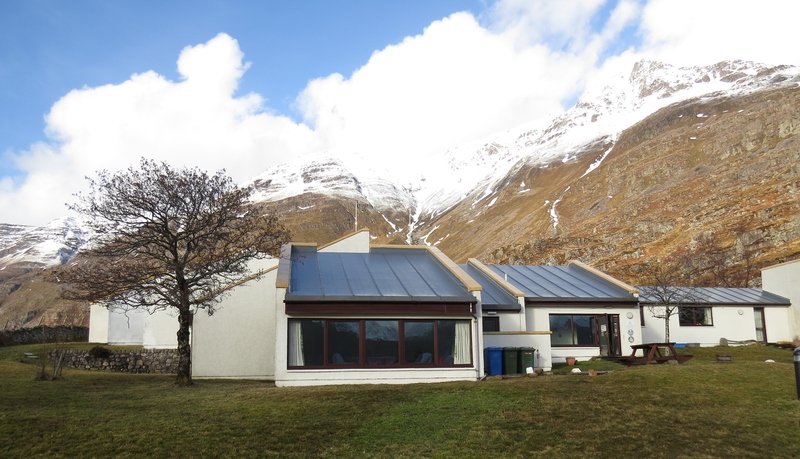 The King’s House on Rannoch Moor which featured in Joyful Journey, Part 2, has changed hands since my stay there, so I have no knowledge of how the new owners operate. 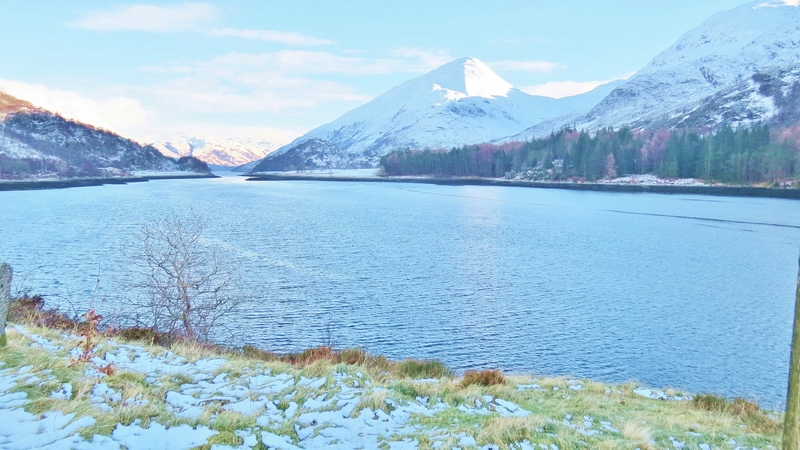 How to get there: If you are using public transport, take the Fort William, Isle of Skye, citylink bus from Glasgow or Edinburgh. 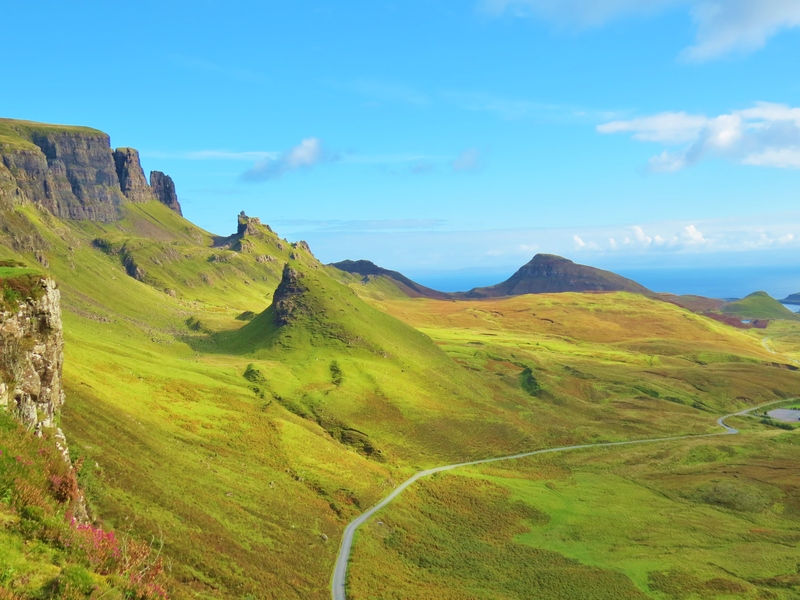 The Isle of Skye, largest and most northerly of the Western Isles in the Inner Hebrides, is connected to the Scottish mainland by the Skye Road Bridge. 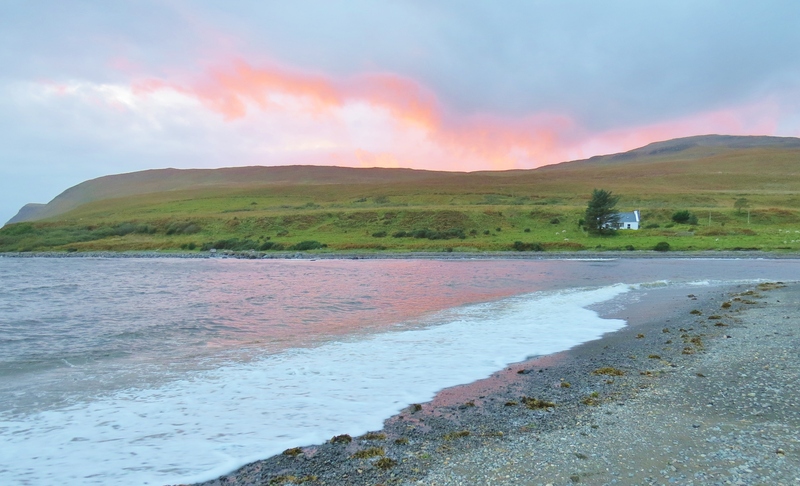 As the crow flies, Skye is only 50 miles long but has over 400 miles of shoreline. 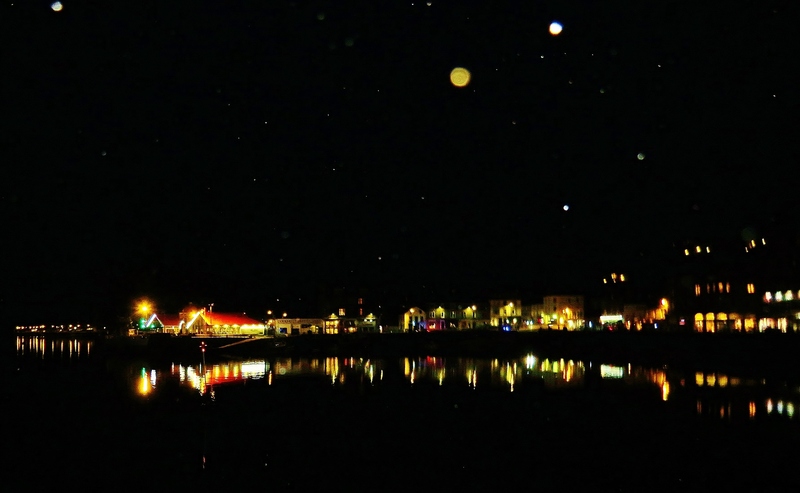 The population is around 10,000. 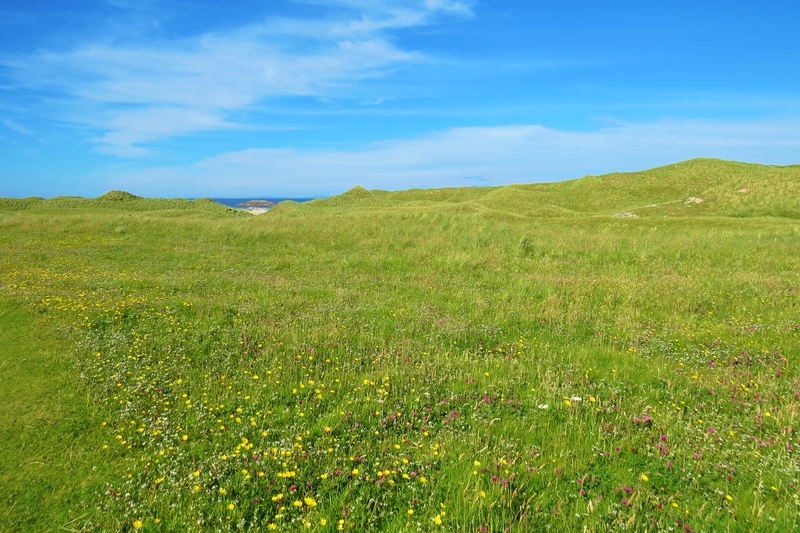 For such a small area, the island landscape is amazingly varied. 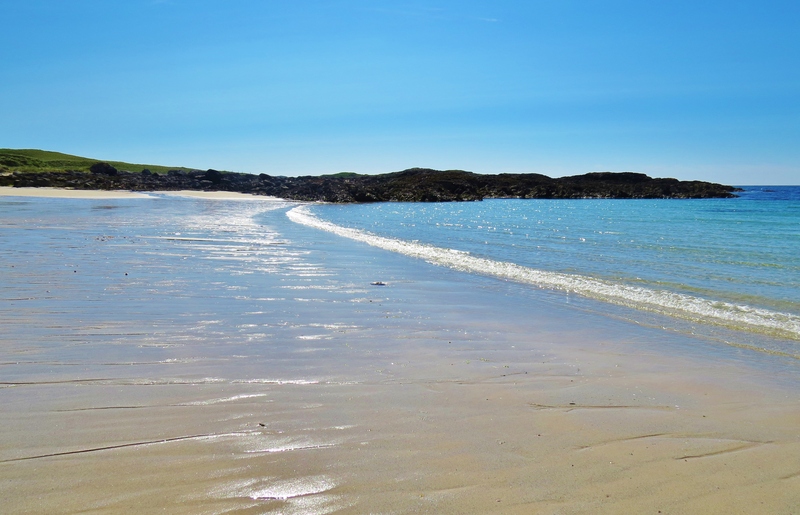 At the South of the island, Brittle Beach, pictured below, lies on the edge of Glen Brittle, an area of gently rolling hills, moorland and pasture in the shadow of the Black Cuillin, a rugged mountain range that rises straight out of the Cuillin Sound, in the Atlantic Ocean. 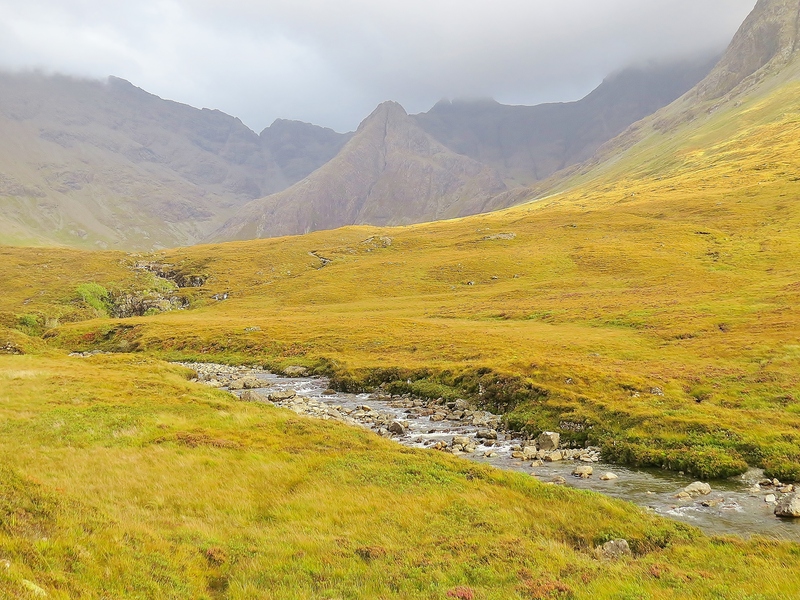 Near the north entrance to Glen Brittle, the landscape dramatically changes to wild moorland, across which runs the River Brittle, from its source below the Black Cuillin. Hidden in the foothills only a short distance from Brittle Beach, is a wonderland of waterfalls, cascades, rocks and magical looking pools. 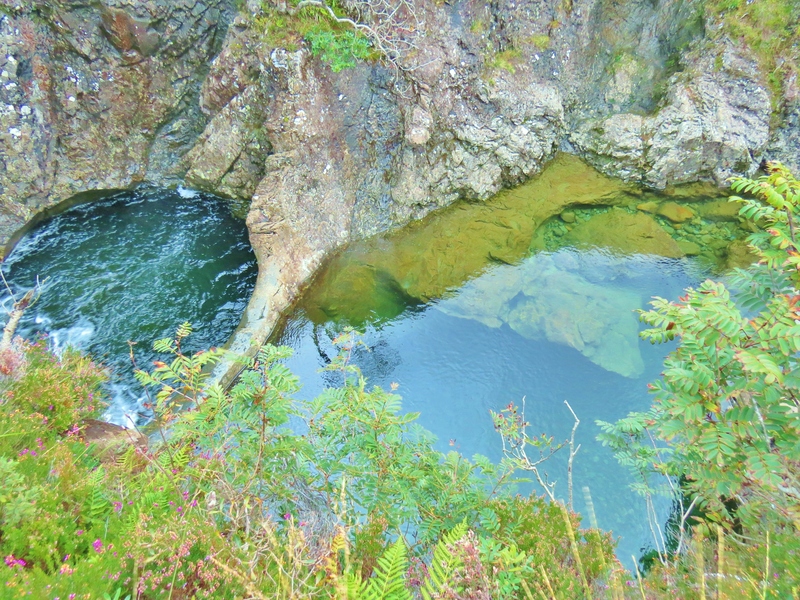 The ferrous oxide (iron) that oozes from the rocks into the water, along with the variety of rock types, gives brilliant colour to the water. 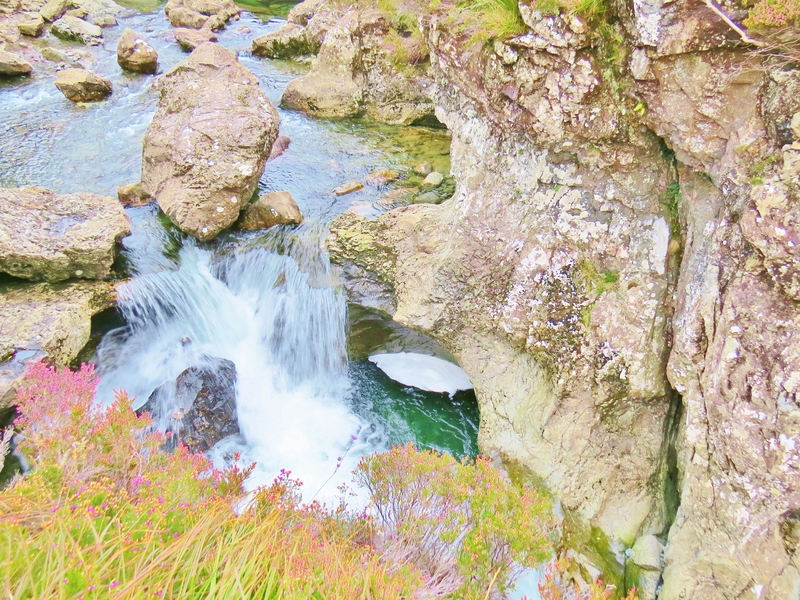 This area is well named, The Fairy Pools. It was late on a cloudy day, in fading light, when the photos of the pools were taken, but, even so, the place looks truly magical. 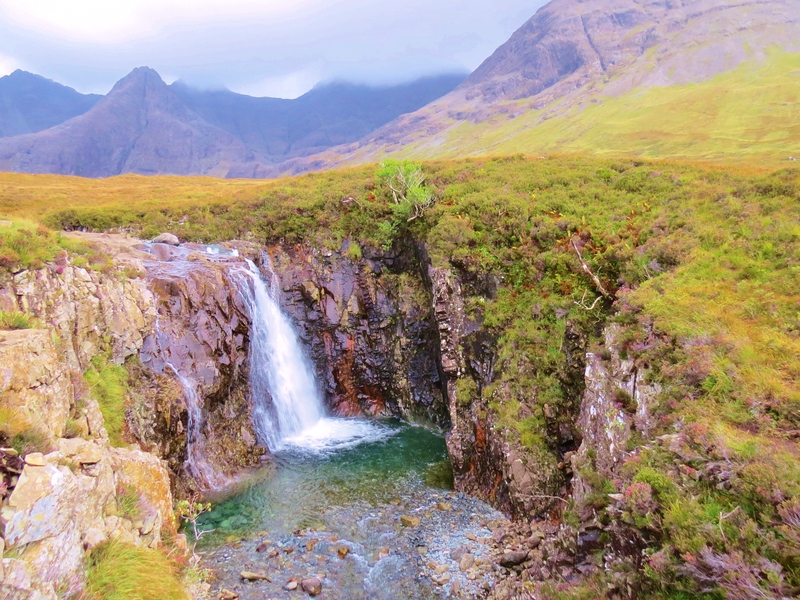 The area is called Fairy Pools because, in island lore, this magical place is home to fairies, those tiny, mystical entities, who, Celtic people believed, frequent the world of mortals and must be respected lest they use their magical powers to wreak havoc. 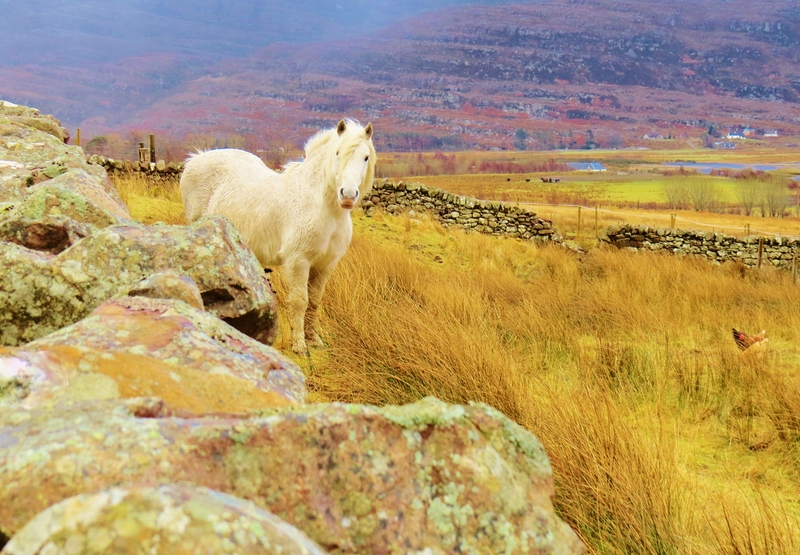 It is difficult to be in the Western Highlands of Scotland and not find oneself being made into a believer. There is an other-worldly, mystical air in so many places. 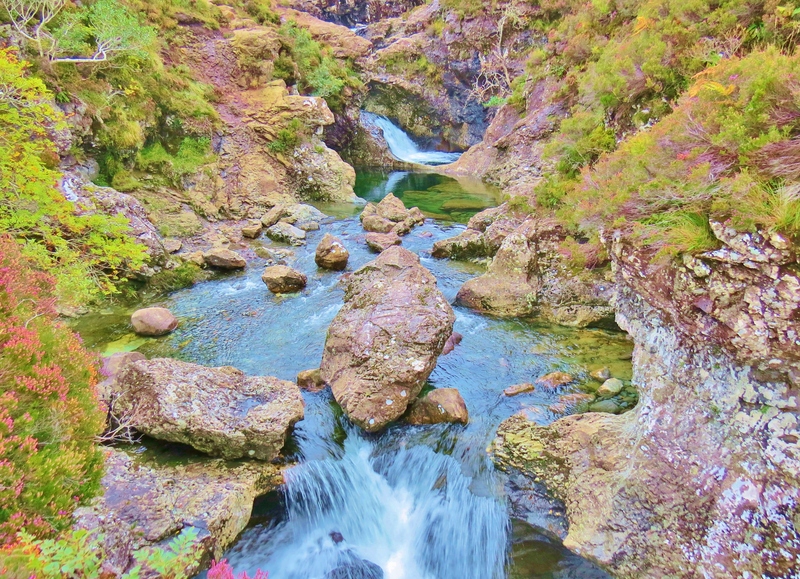 On Skye, the Fairy Pools is one such. 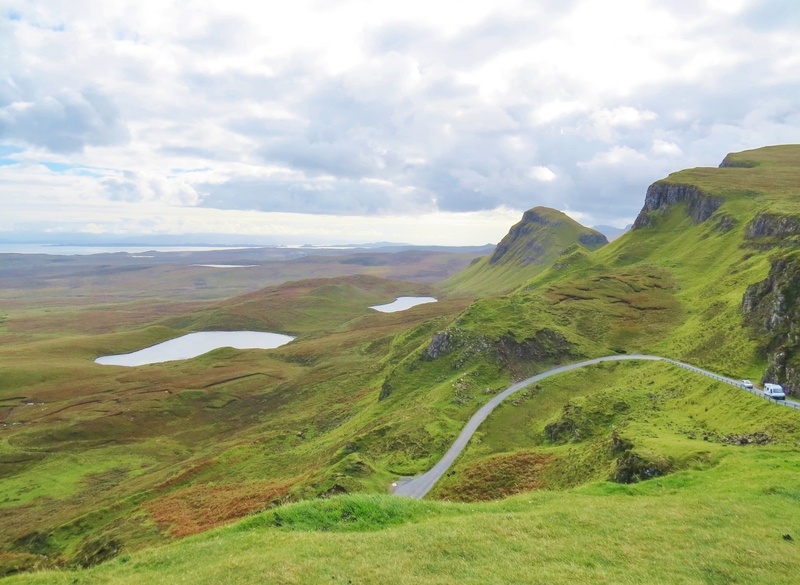 In the north of the island, the Trotternish Peninsula provides some spectacular, varied and unique scenery. 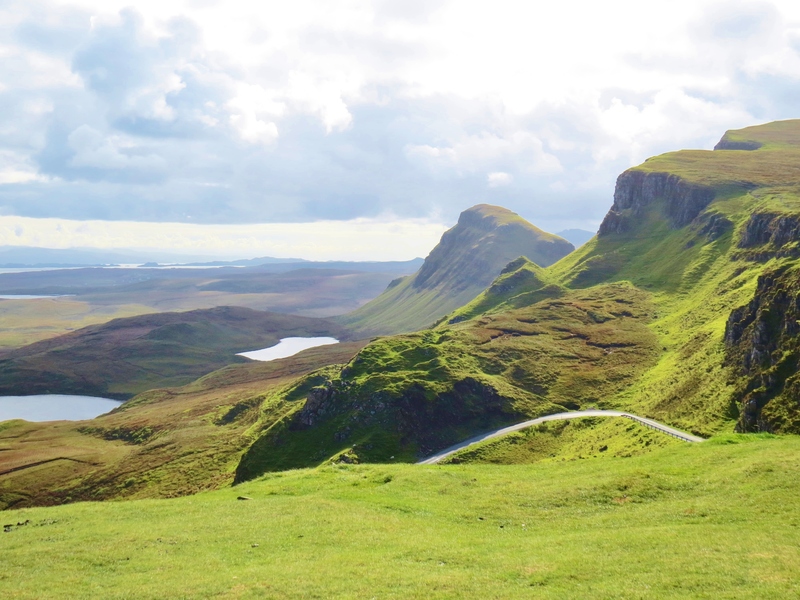 Running up the length of the peninsula is a spine-like escarpment known as the Trotternish Ridge, a series of steep hills including thirteen peaks, the highest being part of The Storr. 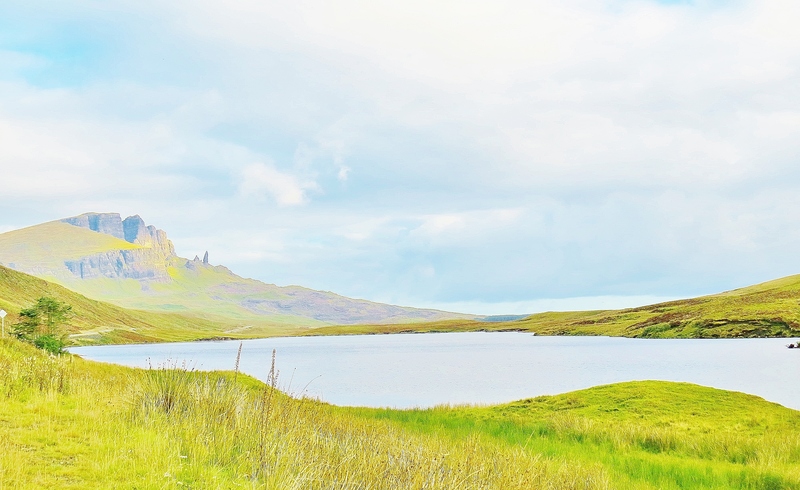 The Storr is a series of rocky peaks, the best known of which is The Old Man of Storr, a basalt, needle-shaped column that affords a challenge to climbers. It was not scaled until 1955. At only 719 metres (2,358 ft), what it lacks in height, it makes up for in level of difficulty. A short distance from the ridge, red coloured dolerite rock forms cliffs and columns along the Eastern Coast of the peninsula. 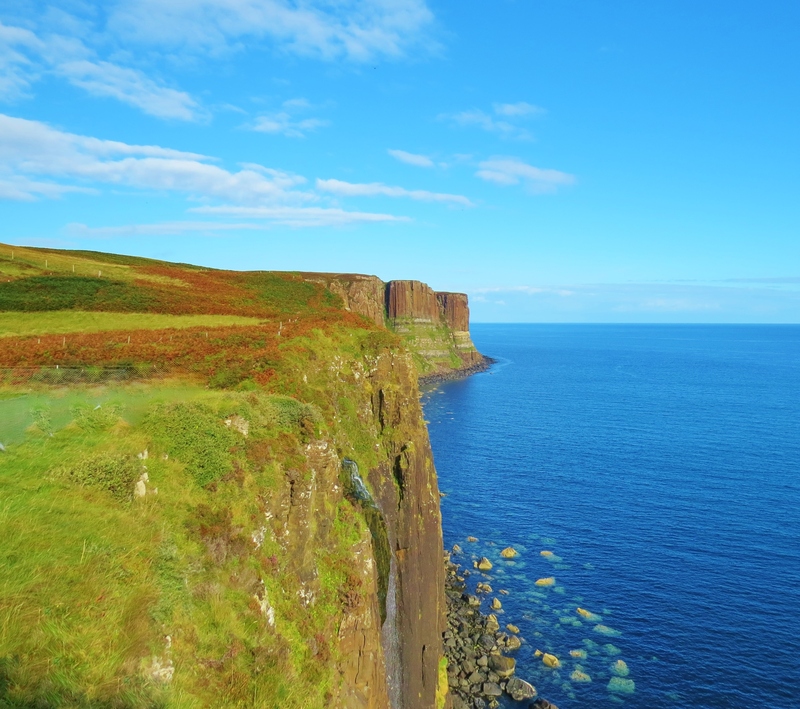 Kilt Rock is made up of massive columns of dolerite giving it a pleated look, hence the name. The light coloured lines are evidence of ice sheets pushing across the sedimentary rock. 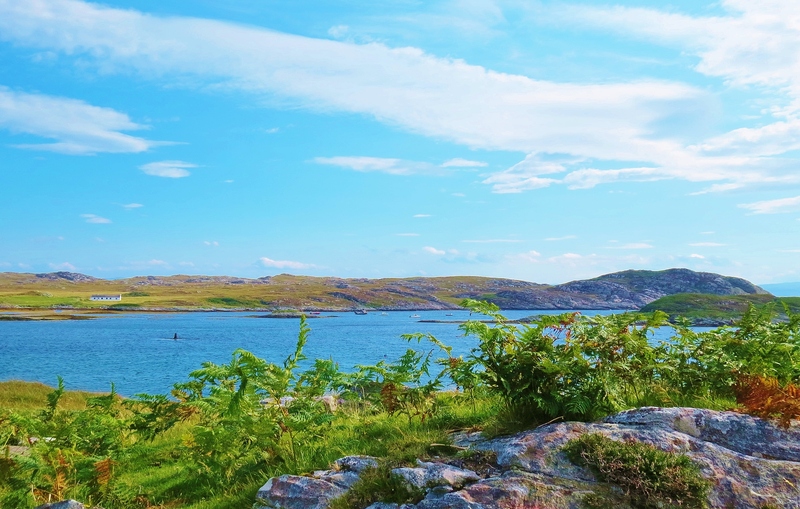 This stretch of coastline affords panoramic views of the Isles of Rona and Raasay with Wester Ross on mainland Scotland in the far background. 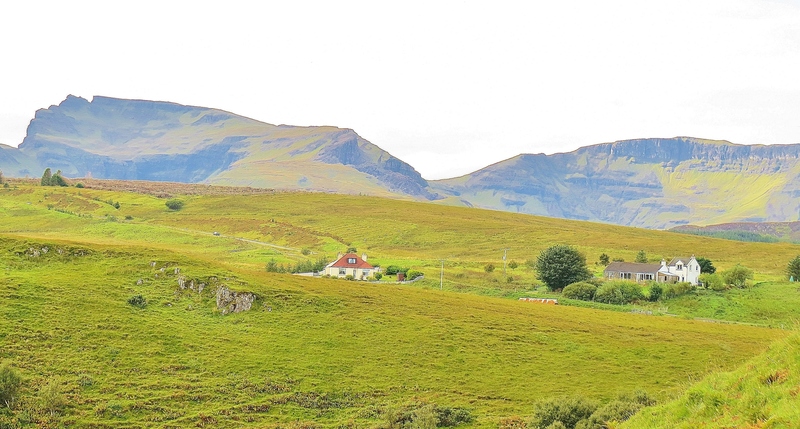 The unique, one of a kind Quiraing is also part of the Trotternish Ridge. This landslip area of peaks and gullies is made up of many layers of basilistic lava to a depth of about 800 m (2,624 ft). On the east side, the underlying sedimentary rock has collapsed under the weight, sliding downwards with a tipping sideways motion. The result is a somewhat bizarre looking landscape of pointed, grass-covered peaks and bowl-shaped valleys giving it the look of some alien planet. The slipping of the land on the east side of the ridge continues today as it has done for eons. 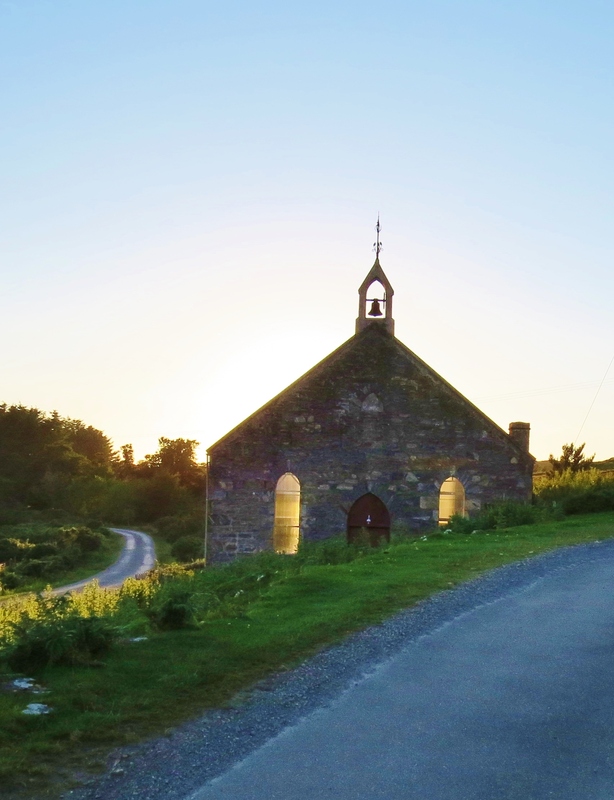 The evidence is seen at Flodigarry where the road has to constantly be repaired. 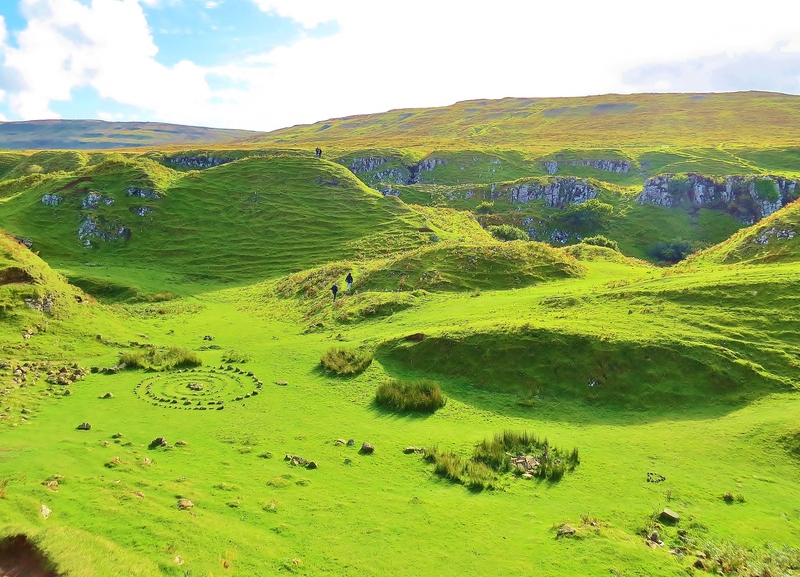 On the west side of the Trotternish Peninsula, near Uig, we once again find an area frequented by fairies, this time, the Fairy Glen. 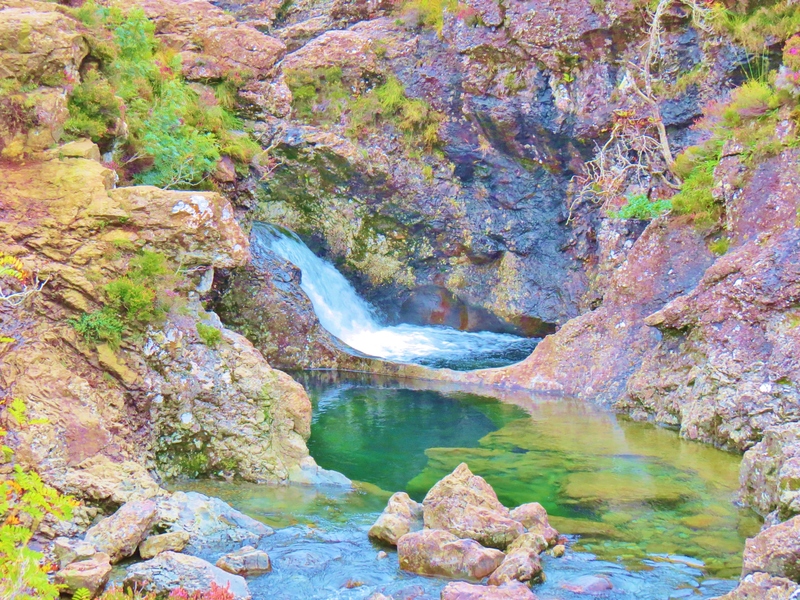 This is a place which, like the Fairy Pools, is steeped in fairy lore. It, too, has a magical feel to it. 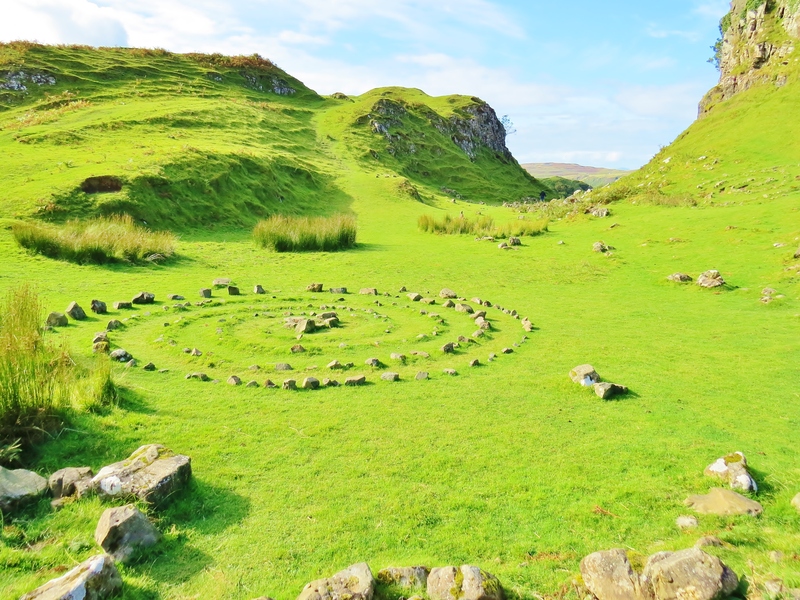 Ask about the circles of stones and the only answer one is likely to get is that this is the work of the fairies. Watching over the fairy circles is, what geologists would call, ‘a basalt intrusion’, but is commonly known as ‘The Castle of the Fairy King’ or Euan’s Castle’. 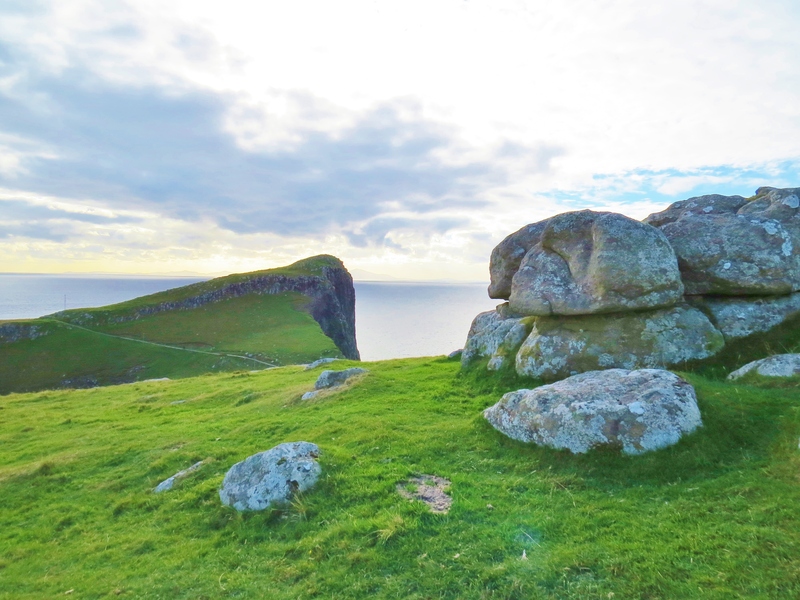 West of the Trotternish is the Waternish Peninsula and further west still, as far as one can go, is Neist Point. There is a lighthouse there, but I was, unfortunately, unable to get to it, so contented myself with photos of the headland obscuring my view and the coastline nearby. 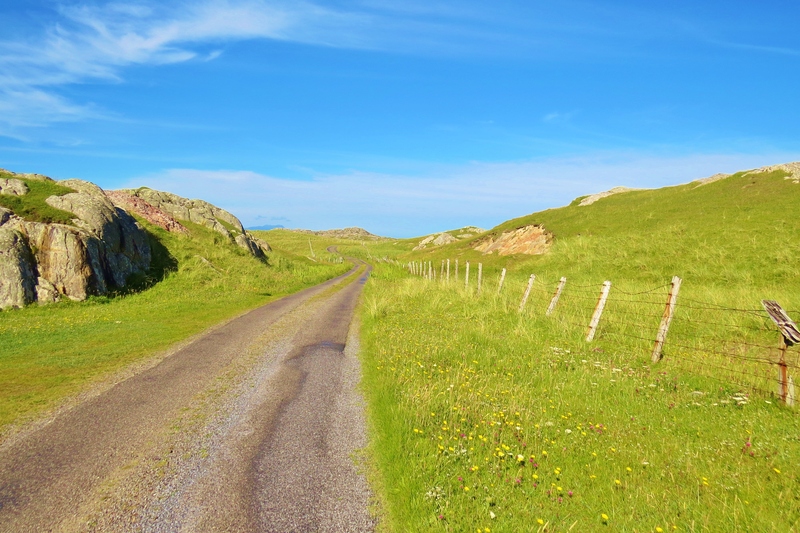 This is MacLeod country and en route to Neist Point, the road goes through the village of Dunvegan. 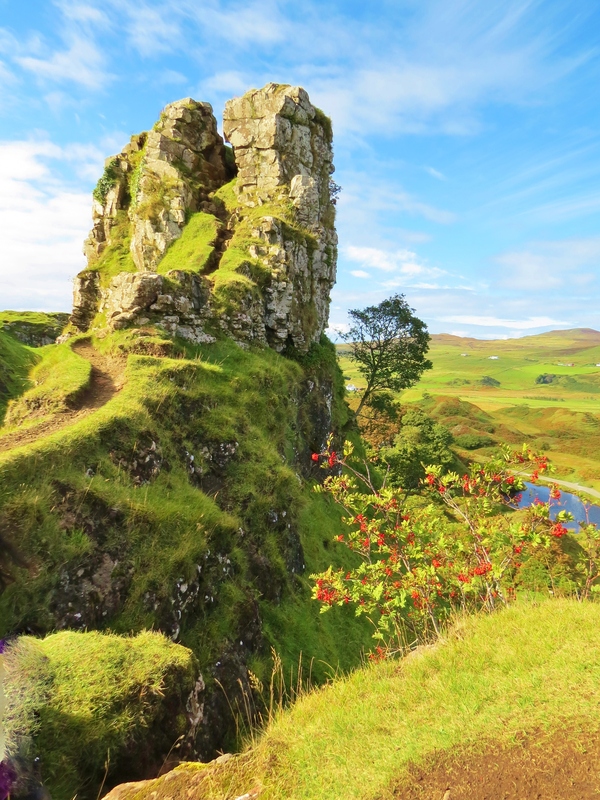 Dunvegan Castle, home of the MacLeod ‘chief’, is near there, but another place I missed. 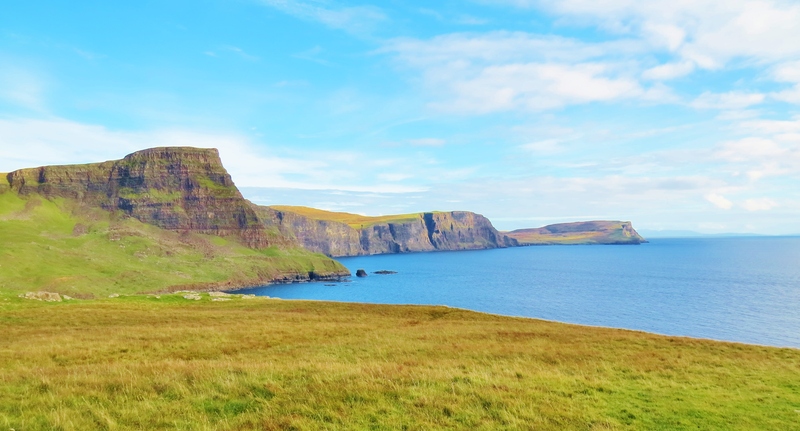 On the other side of this pointed headland is the lighthouse which marks the most westerly point of the Isle Of Skye. 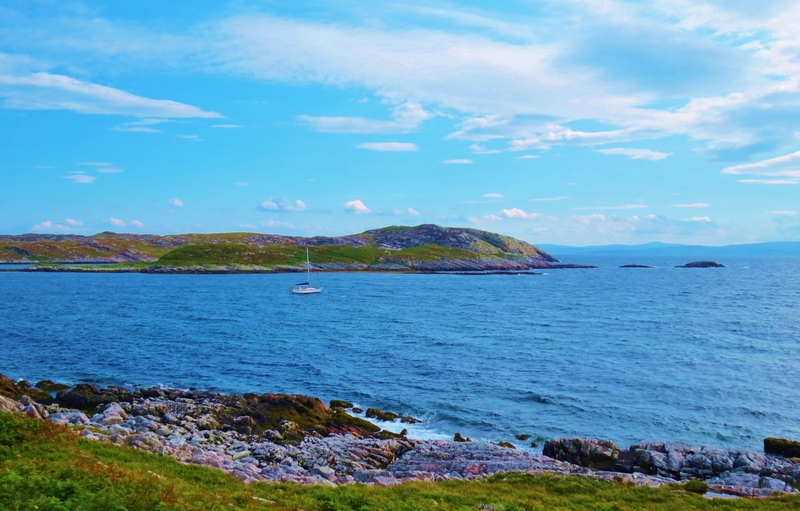 Across The Minch, the Outer Hebrides are visible. 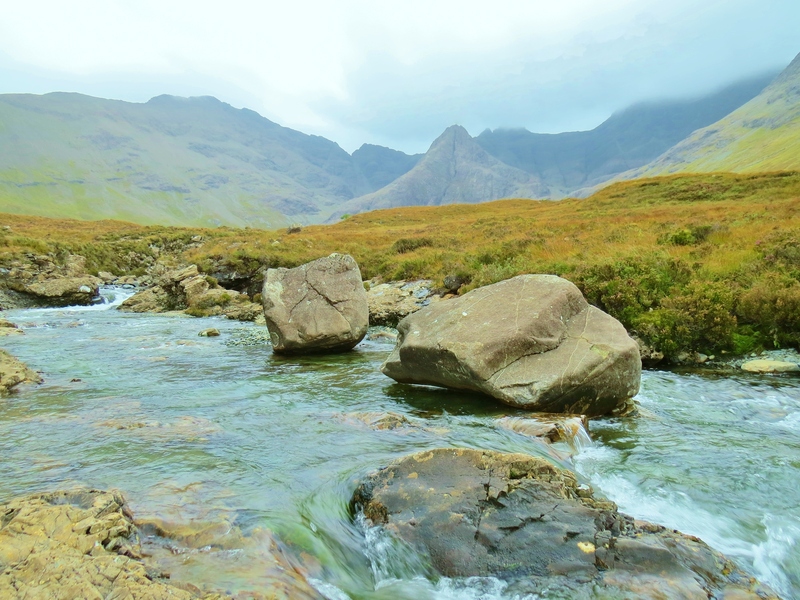 Geology: The Isle of Skye is a geologist’s dream. The vast variety of rocks and minerals are well catalogued by both professional and amateur geologists as well as rock hounds. 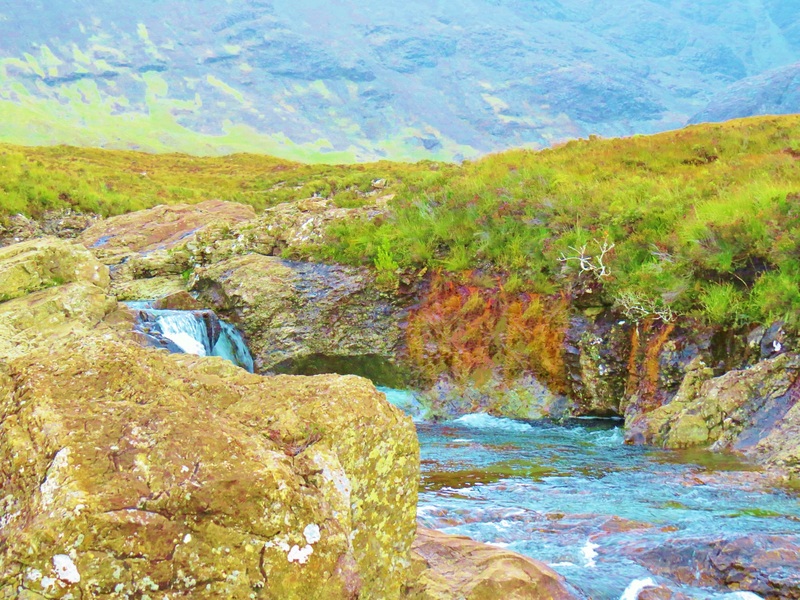 Google or any good search engine will provide reams of information if interested parties ask for ‘Isle of Skye geology’. How to get to the Isle of Skye: Citylink buses run from Glasgow airport directly to Portree on Skye via the Skye Road Bridge. 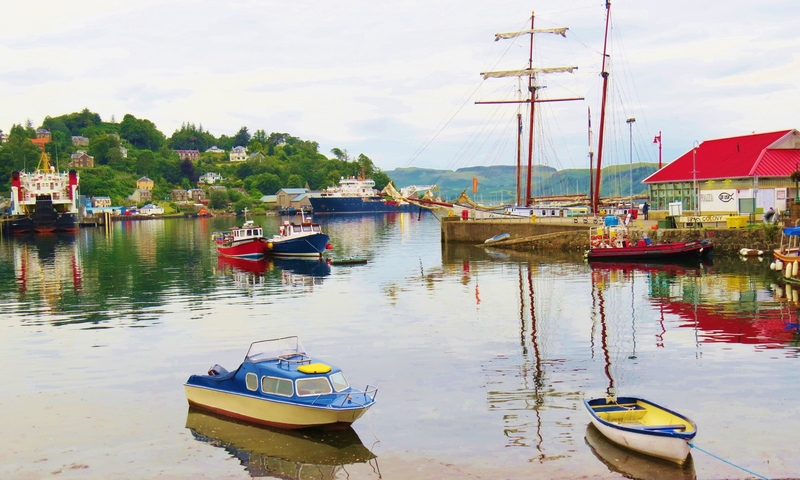 Trains from Edinburgh and Glasgow go to Mallaig. 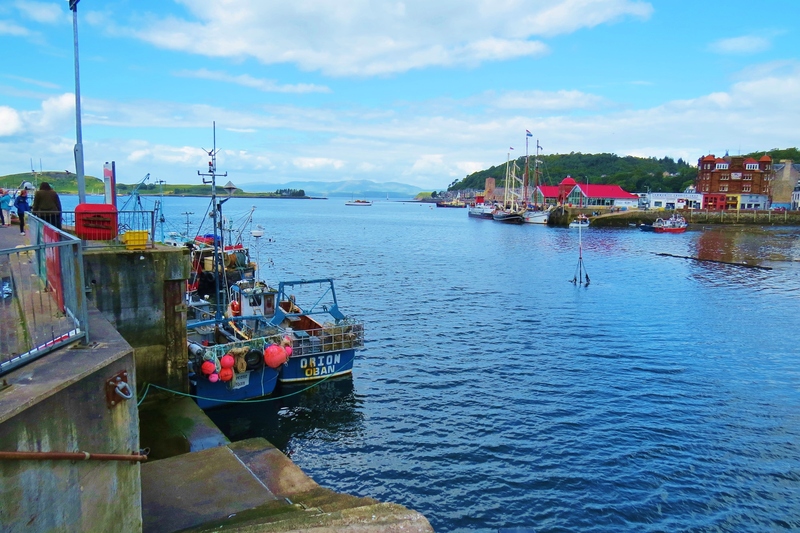 From Mallaig, a car ferry goes to Armadale at the South end of Skye. Good roads lead around the island. 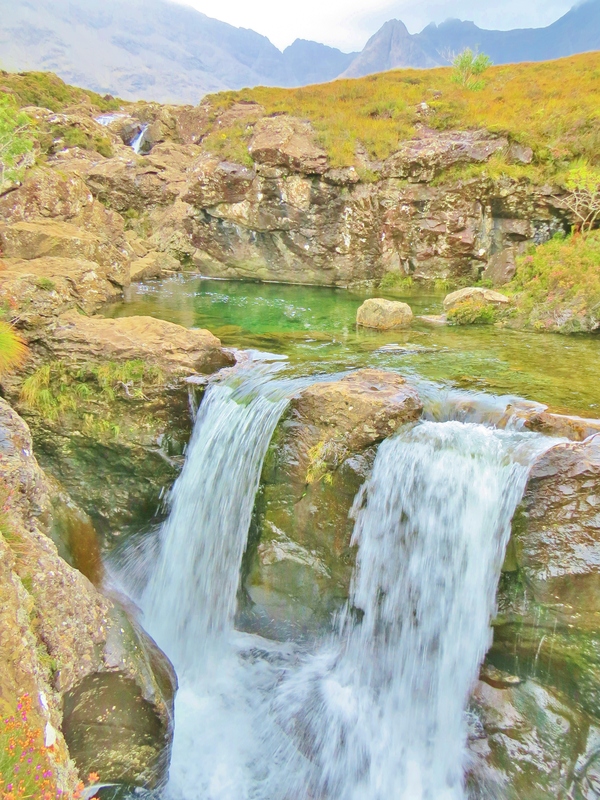 Credits: The photographs of the Fairy Pools and the Black Cuillins were taken by Niall Palmer of Skye for lochsplus. They were edited by lochsplus. All other photos by lochsplus.